Return to Financial Insight's main page. Click on an individual date to jump to its outlook, or scroll down through all the Market Outlooks. First with the recent sudden drop in the Markets, my advice: Do Not Panic. We have seen this before and no doubt we will see it again. Markets often over react and those who over react with it usually pay the price. Obviously I do not know what the next week, month or even year will bring. This could be a blip, or something longer but history has shown that holding a diverse portfolio of high quality stocks and staying invested pays off in the long run. Also, I cannot stress enough, if anyone tries to tell you that they can advise you when to get in and out of the market, run away, and the more confident they sound the faster you should run. The chart on the right shows the percent that the DOW went up or down in red for the years 2008 to 2017 and the percent the TSX went up or down in blue for the same years. As you can see there were two down years for the DOW and three for the TSX, and in each case, down years were followed by up years. It is also worth noting that for 70% of the TSX (80% for the DOW) years the market went up which is in line with our past analysis of up versus down years. Put another way, you can try to second guess the market, but based on this you need to be right at least 70% of the time. Maybe you are better than I am, but I doubt I could second guess the market in the short term and be right over 70% of the time. Also, it should be noted that while the DOW dropped about 9% since it peaked on January 27, 2018, it was up by about 25% for the year 2017 and this drop takes it back to late November values. So yes it was sudden and significant, and it could get worse, or not, before it gets better, but in retrospect, so far at least this is just a hiccup for the DOW. Although the Canadian case, that I suspect is currently just following it's southern neighbours lead, is somewhat worse as it's drop takes us back to November 2016 values. But in either case, trying to second guess the next move is a speculative gamble at best. So, as always my advice remains the same, build a diversified portfolio of high quality stocks and stay invested while following our four IFC Investment Principles (shown below). In October of 1995 I wrote Market Timing Can Improve Your Returns, But You Better Be Good. Here I demonstrate just how good you need to be to beat a buy and hold strategy. Better than you might think. For this one you will need to click the link to download a pdf copy of the original paper article. In January of 2012 I wrote the rule that Trading is a Negative Sum Gain. Here I show how overall the majority of traders have to under perform the market. It is simple mathematics. In 2012 I wrote Seeing Can Be Misleading. While I do like charts, I used one here, I show how easy it is to be misled by charts and give questions you should always ask. On a slightly different note, with all the constant promotion of speciality investments etc. can I call your attentions to our January 2000 issue of Financial Insight? While it is fairly long, in it I review the previous 20 years (1980 - 2000). We posted it shortly before the technology bubble burst. In it I gave examples of how different very popular investments had blown up in investors hands. You might call it the Famous Last Words issue. Finally, the proof is in the pudding, so to speak. Building and holding a diversified portfolio of high quality stocks has worked out pretty well for me. Here is a chart showing the value of $1,000 invested in my portfolio since January 1, 1998 compared to the markets. In January I wrote, "I cannot help but feel that we are nearing the point of maximum pessimism." My point being that people should resist the temptation, maybe even strong temptation to sell their stocks and/or look for a new approach. Well, the final numbers are not in yet, but unless something significant happens in the next 2 weeks, it looks like for 2016 the TSX will be up about 17% and the Dow will be up about 14%. Now while there is optimism, there are some who are suggesting that this pace cannot continue and they are contemplating getting out of the market. It never ends. Yes it looks like 2016 will wind up being a good year, and while that does not ensure that 2017 will be a good year, neither does it suggest that it will not. Looking at relatively recent history: In 1999, following a year with a small loss of about 3%, the TSX rose almost 30%, then was followed by a more modest 6% in 2000. Granted there were more significant losses the next 2 years. But then in 2003 it rose about 24% followed by about 12% (2004) 22% (2005) 15% (2006), 7% (2007)then finally a loss of about 35% in 2008. But then it recovered in 2009 gaining about 31%, followed by about 14% (2010)before losing about 11% in 2011. The next 3 years were single digit gains to 2015 which loss about 11%. So this years gains follow last years loss. So what does that mean for 2017? If my crystal Ball worked, I would tell you. Or maybe I would just keep it to myself and make a killing. As you can see, sometimes a good year is followed by another, sometimes it is not. Which leads me back to the same advice I gave at the beginning of the year. "My advice remains the same as always, build a diversified portfolio of high quality stocks and stay invested." Finally, the proof is in the pudding so to speak. Building and holding a diversified portfolio of high quality stocks has worked out pretty well for me. Here is a chart showing the value of $1,000 invested in my portfolio since January 1, 1998 compared to the markets. I cannot help but feel that we are nearing the point of maximum pessimism. Maybe it is just wishful thinking or maybe it is because we keep hearing rumblings about how buying and holding stocks is no longer the right approach or you need a new approach. Everything from you have to be an active trader, you have to get out of stocks until a better time, the large number of outfits pushing colored diamonds, TV personalities telling us to buy gold or silver and people pushing businesses that effectively run on subsidies (wind and solar). We have heard it all before and no doubt will hear it all again. Late last year I had a conversation with a broker pushing colored diamonds or something like that. The thing is, the more he spoke the more I heard alarm bells about what he was selling, and I told him so. This only caused him to push harder which raised even more alarm bells. I was recently reminded by my sister that I once told her that if I went away and ignored my portfolio for ten years, odds are that at the end of the period most of my decisions (doing nothing) would have been the right ones. She also noted hearing or reading another interesting comment, I am not sure from who but it was more or less to the effect that the people who lost the money in 2008 were those that sold. That sounds about right. First can I call your attentions to our January 2000 issue of Financial Insight? While it is fairly long, in it I review the previous 20 years (1980 - 2000). We posted it shortly before the technology bubble burst. In it I gave examples of how different very popular investments had blown up in investors hands. You might call it the Famous Last Words issue. In November of 2014 I wrote Computer Models: The Great Deception. There is no end to the number of Computer Models being used to try to beat the market. Here I explain the inherent weaknesses in these approaches. In 2012 I wrote Seeing Can Be Misleading. While I do like charts, I show how easy it is to be misled by charts and give questions you should always ask. In March of 2000 I answered a question explaining why we should not have expected technology stocks to continue to soar. And by the way, they didn't. Finally, the proof is in the pudding so to speak. Building and holding a diversified portfolio of high quality stocks has worked out pretty well for me. Here is a chart showing the value of $1,000 invested in my portfolio over 18 years ago compared to the markets. On the more fun side, if you like to fish or have a corny sense of humor like I do, then you might enjoy my Dave's Rule from August 1995. But remember, that one was a fish story. Where do we start? It has been a fascinating year. It ended very different from where it started. It started out looking a little shaky but overall we remained confident, by the end it seems that all you were hearing was doom and gloom. Is it really so bad? Is the world really coming to an end? Well, to quote my sister, "I wish the press would stop throwing gasoline on the fire." If I can add to that, I also wish the politician's would stop throwing gasoline on the fire. All this makes people believe that things are far worse than they really are, this not only worsens things, it leads to governments feeling the need to do something, even though they have a lot less control than they are prepared to admit and even though any action they take, will have a delayed impact of at least six months to a year. So in the end, these actions, many of which will be unnecessary, will in all likely hood be ineffective and in the long run there will be a price tag attached. Let's hope that the majority of the cost will be for infrastructure projects that need to be done anyway and once done will be over, avoiding the continuous structural costs of the past. On a positive note, if I can quote Marian, my wife, when she sent out our annual Christmas letter, "Given how the last few months of 2008 has turned out, 2009 may be a tough year, but we have been through this before when we had far less and we will come out of this again and in a few years have far more than we have today." So where are we? We use to have a recession every few years; now we have not had one in nearly 20 years. If you had told me in 1990 that we would go nearly 20 years without a recession, I would have laughed at you. Yet here we are. It has often been said that market based capitalism is not a perfect system, but it is the best we have. I concur. It might be nice if we had a system where we all got the same rewards and we would all work hard for the benefit of the world. Yes that would be nice, but we are not ants, and we are not wired that way. Yes most of us believe in doing the right thing, have a high moral character (although our individual definitions of morality may vary) but we are wired to first look out for the interest and well being of ourselves and our families, then those close to us, then those of the same religion, then our country and somewhere down the line maybe the benefit everyone on the planet. For everyone the list and order will be little different, but you get the point. If you do not believe me, ask yourself: Would you sacrifice the five people most important to you to save a hundred strangers who live on the other side of the planet? How about a thousand? Market based Capitalism has brought the world many innovations. However, it is not perfect and it does need a certain level of checks and balances. The markets greatest weakness is that in the short run it is driven by greed and fear. On the other hand one of its greatest strengths may be that it is driven by greed and fear. As a result, every so often a correction or recession becomes necessary to shake out inefficiencies, realign things and to bring us back to reality. So what happened? Well, aside from being overdue, a number of things. However, it appears that the most significant was a financial crises brought about by a thing called sub-prime mortgages. As I understand it, it went sort of like this. The economy was doing very well. Governments (especially the U.S. government) believed it would be nice if more people could own their own homes. Their hearts were in the right place. Since interest rates were low and house prices were climbing, at the time it seemed like a good idea to let people borrow 100% of the value of their home (nothing down) and then only require them to make interest payments. Since values were rising, people would accrue equity through the inflated house values. And inflate they did as people who could not really afford to buy their own home entered (maybe flooded) certain markets. Of course this also had to be financed. Some of this came from traditional sources, but then clever financiers decided to package the loans into investment vehicles and sell them as sound mortgage backed securities. Of course most of the investors did not really know or understand what they were investing in and it did not help when rating agencies gave the vehicles high ratings. This might not have worked so well had there not been a lot of investors reaching for yield, something we have discouraged. In our opinion, reaching for yield, or looking for higher and higher returns from fixed income securities has become a problem since the days of high inflation and high interest rates. Investors remember when they could get 10% plus interest on secure investments like government bonds and GIC's etc. They have this misguided idea that they should still be able to get these high rates without risk and go looking for them. Brokers and advisors who want to please their clients then promoted vehicles that we considered inappropriate like junk bonds, income trusts, sub-prime mortgages and hedge funds to name a few, without due regard for risk. Everything was good until the inevitable hick- up and then the whole thing unraveled. Few saw it coming. While we always thought that things like income trusts and hedge funds were ill-conceived, inappropriate for most investors and would burn their investors, we never saw this coming. So what happens next? Well only time will tell. I recently called the bottom, but as I like to say, it is only about the fourth time I called the bottom, and eventually I will be right. Personally I think that we have seen the market bottom and that sometime in late 2009 the economy will turn too. But it could take longer. The road back might only take a year or so, but it could take a few, but I am confident in the long term future. Globalization, technology, the internet and automation are wonderful things that should ultimately benefit people around the world and in time bring us all closer together. But the road is bound to be a bumpy one. If you strip away the money and financial terms etc. what you have left is a finite amount of resources. By resources I mean work force, infrastructure, buildings, plants and natural resources etc. This is not a physical disaster like the flood's of New Orleans's where physical assets/resources were destroyed. It is an economic recession and it does not change the amount of resources available. What it will do is change how those resources are owned and how and where they are deployed. In the end, that will probably mean that they are used more effectively, resulting in a stronger economy, a better standard of living for more people and hopefully a greener economy as the shakeup will provide opportunities for change. So what is an investor to do? We believe that our principles are more important than ever. Panicking will only cost you. Hopefully you have a diversified portfolio of high quality stocks. Both quality and diversity are very critical at this juncture. A friend asked me the other day what sectors he should emphasize now. I pointed out that there are more ways to be wrong then right and I believe that being diversified is extremely important, especially right now. More importantly, you need to be sure not to be overexposed in any sector or company. Second, I cannot stress quality enough. Most of the best companies, many of which remain profitable will benefit from the shakeup and eventually flourish. Many of the lower quality ones will disappear. On closing, be patient and remember Marian's words "we have been through this before when we had far less and we will come out of this again and in a few years have far more than we have today." IFC: Since we spoke a year ago a lot has happened. At the time you spoke of your returns and indicated that while you might lose money in the bad times, you tend to outperform the market during the bad times. So how do your returns look now and would you change your approach? Heinze: I definitely would not change my approach. It is because of times like these that I stick to my approach. To follow up from last year, for the year 2008 my personal portfolio lost 28%. I believe that was my worst year ever. But that still beats the market and most Canadian Equity mutual funds. Also, to put it in perspective it was equal to giving up the last 3 to four years returns. That may sound bad, but after 30 years of investing it is not really a big deal and it is bound to happen from time to time. IFC: So that is like giving up some previous gains. Do you wonder if you should have sold high and avoided the loss? Heinze: If my crystal ball worked, I would be much wealthier than I am now, but it does not. Yes I gave up some gains, but if I got out of the market every time there might be a setback, I would never be in the market and I would not have any gains to give up so I would be a lot poorer today. Reality is that it is three steps forward, one back, two forward, one back, five forward three back kind of thing. But at the end of the day, or decade, my approach provides good returns with minimal losses. IFC: Last time you compared you returns to Canadian Equity mutual funds. How do you measure up now? Heinze: I am happy with my relative performance. Of course while I know my numbers, comparative information as at December 31 is not yet available. As of December 31, for the year 2008 my portfolio lost 28%, for the ten years ended December 31, 2008 I had an average annual return of 6.4%. However, we can compare the period ended November 30, 2008. For the 12 months ended November 30, 2008, I lost 26.8%. For the 10 years ended November 30, 2008, I had an average annual return of 6.8%. Based on Globe Investor Gold funds reports, that puts me in the top 22% for one year returns and top 20% for 10 year returns for Canadian Equity funds, which is the best comparison I have. I also want to point out, as I did last year, that is of the funds that survived, as not all the funds in existence at the beginning of the period were still around at the end. IFC: You talked about funds that disappear last year so we will not rehash it today. If readers wish more on that they can scroll down to that conversation which is reprinted below. In light of the economic times, perhaps we can talk about some economic issues. First, have you ever seen anything like this before? Heinze: This actually reminds me a lot of 1982. When I look at a log chart of the TSX going back into the seventies, I see striking similarities. The drop is similar to the one that happened in 1982. At around 9000 the percentage drop was almost identical, so we have dropped a little more from top to bottom, assuming we have seen the bottom, but really it is a very similar chart. I lived in Calgary in 1982 and the current housing market in parts of the United States really reminds me of that time in Calgary. I think this is very similar to 1982 and the market recovered and thrived after that. It worked out very well for us, in 1984 we bought our first house and as luck would have it we could not have planned it better. I talked about that in the January 2000 issue of Financial Insight that is reprinted on our web site. Heinze: Yes there are some positive differences. In 1982 we were facing runaway inflation and runaway interest rates. Today, interest rates and inflation are both under control. Also, it appears that most of the economic powers are working together. If they continue and resist the urge for protectionism, then we may be about to witness something unprecedented, global cooperation. The other difference is in the approach of government, or at least in the Canadian government. In 1982, the Liberal government tried to spend its way out of the recession, something we could not afford, especially given the runaway inflation and interest rates of the time. This created huge structural deficits that took years and two different governments to bring under control. Today, inflation and interest rates are under control and we have a healthy fear of deficits. IFC: Do you oppose Government stimulus at this point? Heinze: I am concerned. One of the most dangerous things an investor can say is "this time it is different." But there are differences. Inflation and interest rates are under control and there is a very real understanding of how dangerous deficits can be and what they will cost. But yes, I am concerned. However, there is a lot of infrastructure that needs tending to and sooner or later we will have to pay for it. It seems to me that this is the time to do it, while costs are lower and labor is more available. We get the job done, cheaper, get some stimulus and wind up with a better infrastructure that helps position us for recovery. As long as we only do what needs to be or should be done and do not do projects for the sake of doing projects and once they are done we stop. IFC: How do you feel about corporate bail outs? Heinze: Fundamentally I oppose them. It has been said that subsidy and government bailout are the Canadian way. I refer to this as pulling everyone down to the lowest common denominator. It is far better to create an environment that encourages competition and rewards success which in the long run will create more jobs and opportunity and pull everyone up to the highest common denominator. That is the Canada that I would like to see and I like to believe it is achievable. Having said that, I am more sympathetic than I normally would be. The financial crises created a situation that no one could have reasonably been expected to be prepared for. However, I am worried that in the long run, we may do more harm than good. Probably the best thing governments can do is to try to grease the wheels of the financial system the best they can and get things going again, this will create an environment for success. IFC: What about the auto sector? Heinze: The same holds true for them. It may be necessary to give a temporary life line but in the end the best thing that can be done for them is to get the economy and the money flowing again. At the end of the day, there will be an auto sector, as people will still be buying cars. However, I expect that the sector will be very different then it is today and I hope that by throwing them a life line we are not just deferring the inevitable. IFC: Well it looks as though 2009 will be a very interesting year. I look forward to seeing what happens. Thank you. Heinze: I look forward to it too, and you are welcome. Editors Note: Here is an updated chart in pdf format of the respective performance of $1,000 invested in Dave's portfolio verse the TSX and the DOW from January 1, 1998 to the end of January 2011. FI: Tell us about your investment performance. Heinze: Probably the most relevant is the performance on my own portfolio, as it resembles a Canadian Equity mutual fund. For the 9 years ended December 31, 2006, my portfolio had an average annual return of 11.5%. This beat the TSX composite and the Dow Jones Industrial Index's that had average annual returns of about 9.3% and 7.0% respectively. Here is a chart in pdf format of the respective performance of $1,000 invested in all three to the end of September 2007. I only have records that can be used to get these numbers for the last nine years. However, from the information I have, chances are my ten year return would be slightly better than my 9 year performance at the end of 2006. Based on GlobeinvestorGold information, compared to the funds that survived the last ten years, 11.5% per year average return would be in the top 7% of all mutual funds in Canada and the top 13% of Canadian Equity funds. If I deduct 1.5% for management fees, my return puts me in the top 14% of all funds and the top 35% of Canadian Equity funds. Editors note: January 23, 2008: For the ten years ended December 31, 2007, Dave's portfolio returned 11.07%. Based on the GlobeinvestorGold information, this put him in the 10% of all funds and top 15% of Canadian Equity funds. FI: What do you mean by funds that survived? Heinze: Well a lot of funds have disappeared over the last 10 years. I cannot seem to find good information on how many funds disappeared, however, it appears that in Canada there were around 2,000 funds over ten years ago. As of December 31, 2006, there are over 6,000 funds listed on GlobeinvestorGold, of those only 1060 funds were over 10 years old. For Canadian equity funds, there were 617 funds listed, yet only 104 were over 10 years old. It is evident that a lot of funds that existed 10 years ago, perhaps even the majority did not survive, and those funds are not included in any comparisons. FI: So what happened to the ones that disappeared? Heinze: Good question. I suspect that while some dissolved, the vast majority were merged with other funds. But lets be fair, very few, if any of the new merged funds would have taken on the name and record of the poorer performer. So the question is, if you bought a fund 10 years ago and held on to it through whatever mergers etc., what is the chance that you would have realized a return as good as the top 50%. You might assume that there would be a 50% chance that you would hold a fund with a 10 year track record in the top 50%, but I suspect that the odds are more like 25% that you would have realized that return on your fund. FI: What about your shorter term performance? Heinze: Well that depends on the period. 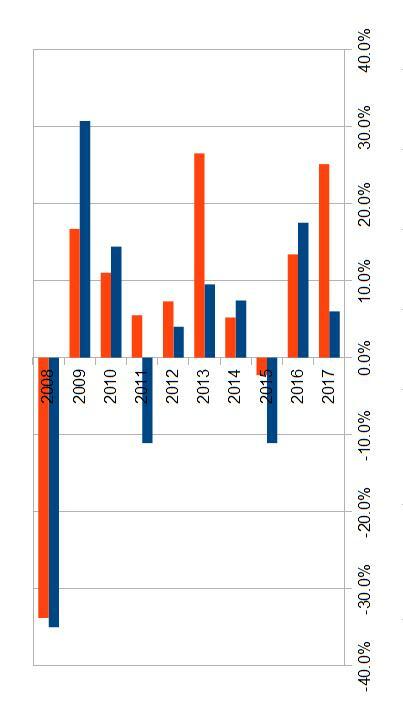 I had a very good year in 2006 with a return of 19.0%, and I beat the TSX that year. But this year while I should make money, I expect that my return will be a little less that the TSX, mainly due to currency losses. All portfolio managers have good years and bad years, I am no different. If you meet one that thinks they will not have bad years, or bad years relative to the indexes, run away. As a general rule, I do well during the good times, but not exceptionally well, I do better than average in the average times and very well relatively in the bad times. I must stress the word relatively. In other words, I may still lose money in a down market, but I usually do a fair bit better than the indexes during those times. I am happy with that mix as it is reasonable and should be fairly sustainable. FI: You mentioned Currency Losses this year? Heinze: Yes, the Canadian dollar had an exceptional year. This can be and is both a blessing and a curse, but that is a whole other discussion. In terms of portfolio performance, like any portfolio holding U.S. stocks, while the U.S. stocks might have made money or stood still in U.S. dollars, they may have lost ground in Canadian dollars. Of course, the TSX is all Canadian, so it would not be affected by this. FI: Okay, so back to your performance. You seem to have pretty sound returns, is there a secret to your success? Heinze: No secret, no magic, no great insights. I do not know the future. Well maybe that is the secret; I know I do not know the future and that I will make mistakes. I also do not expect to make a lot of money fast. That could be an advantage. What I can do is build a well diversified portfolio of high quality stocks that I intend to hold for years, maybe decades. You see, I do know how to pick a good high quality company with a good earnings history and good potential, and, I can be right about that most of the time. Not all the time, but most of the time. I can also calculate a reasonable intrinsic value for a stock. This will not help me time the market, but will help me satisfy myself that I am holding good value overall. Finally, I can build a good well diversified portfolio of these stocks. The rest should be no more then tinkering. My approach is not a secret, but you could say it is a sound formula. FI: Where do you get your ideas about companies to pick? Heinze: A great person once said that everyone needs a hand from time to time. Or maybe I said it, but I am sure I was not the first. There are many publications readily available; the trick is to find the good ones. Obviously I believe those are the ones that think like I do. I will not say they are the best, but two major sources that I follow are The Investment Reporter, put out by MPL communications and Pat McKeough's The Successful Investor. Actually, I get all of McKeough's publications, and he is my favourite. Both of these publications have followed a similar philosophy for years. The Investment Reporter has been around since the forties. McKeough used to write for them, I believe in the eighties. These publications give me sound ideas, help me stay abreast of current affairs regarding my companies without overreacting, and in general give sound investing advise. Then I do my own analysis and make decisions that I believe are most suited to the circumstances. It is worth noting that I do not always agree with these publications, hell, I do not always agree with anyone, not even my wife. For that matter, I may not even agree with myself sometimes. Also, just like me, these publications are not always right. But, their information and recommendations are generally sound and their philosophy is very similar to mine. Or maybe my philosophy is similar to theirs, who knows. FI: Are there other references you use? Heinze: Obviously there are the financial statements of the companies. Also, there are lots of places (including broker research) where I can get information. In those cases I pay attention to things like the financial statements, historical numbers and general information, but put little reliance on the opinions. FI: Why is that? I would have thought that the opinions are the important part? Heinze: Well, as a general rule I do not feel they are that reliable. This can be for a number of reasons; like being too close to the action, over reacting, the all to human inclination of trying to outsmart the future, fear of being wrong, inflated egos, short term emphasis, and even conflicts of interest. I am sure that this does not apply to many sources; the trick is to find the ones you can trust. So I use these mainly for the factual information, mainly the numbers and sometimes the news. FI: What is your thought on investing in trends? Heinze: Have fun and count me out. Personally, until I get my crystal ball working, I will ignore trends. If anything I would invest against the trend, but that is probably my contrarian nature poking through. Or maybe I am just negative. FI: Are you generally negative? Heinze: I do not think so. My mother used to say that I was the last of the great optimise. I think that was and is true. I am a glass half full kind of guy. I would not be where I am today if that was not true. FI: How does that effect investing? Heinze: I think it has served me well. I build a well diversified portfolio of high quality companies with good prospects that I can hold for a long time. And I do hold most of them for many years, sometimes decades. Most years I only turn over about ten percent of my portfolios. You have to be an optimist to do that, especially during turmoil and negative events. There is almost always some reason to panic, but these events, even the worst of them like Black Monday and 911 for example, nearly always turn out to be blips from an overall long term economic point of view. FI: Is that Optimism or steady nerves? Heinze: Probably both. You have to be able to sit through the inevitable bad times and to some extent use them as opportunities when you can. That takes steady nerves, but if you are not optimistic, then I do not see how you can do that. FI: So to sum it up, you're an optimist whose approach is to build a good portfolio of high quality companies that you can hold for many years, or even decades. It is that simple. Heinze: Yes it is really fairly simple. If I were to add anything else, it might be to avoid the popular and fancy investments, especially ones with special bells and whistles. In the end holding hot or fancy stuff, flipping investments or regularly changing approaches will probably kill you, investment wise. But you might make your broker rich. In the year 2003 the TSX grew 24% and the DOW grew 25%. By any measure that was a truly outstanding year but not totally unexpected given the three previous dismal years. Yet there are still large numbers of people sitting on the sidelines waiting for a solid recovery before they start investing. That speaks well for the future. Markets climb a so-called wall of worry. Then overconfidence sets in and the inevitable setback occurs. Then, just as the point of optimum pessimism sets in they turn upward. If we could determine when these points of maximum confidence and peak pessimism were we would have it made. However, reality is that we cannot. Given that qualification, and any significant unforeseen events, we believe that 2004 will be a good year for investors, not necessarily as good as last year, but good nonetheless. Last year was the first good year following the longest and deepest market setback since the forties, so the upward trend is likely to last a while. Also, we believe that there is still a lot of pessimism and as a result, a lot of money on the sideline waiting to come into the market. While there are concerns about the low U.S. dollar, it will make U.S. companies more competitive and since the U.S. is the biggest economic driver in the world, this energy will filter down. Next, there are economic drivers like the maturing baby boomers who are coming into the most affluent years of their life cycle, efficiency is continually increasing, globalization is ultimately good for everyone, and recent tax cuts are still a positive factor. Finally, this is the year of the U.S. Presidential election, so there is a lot of incentive for those in power to ensure that overall the news is good. So baring any significant unforeseen events, we believe that 2004 will be a good year for the markets, but our advice remains the same. If you have been following our IFC principles, odds are that you held up reasonably well through the set backs and did well last year. Regardless, these principles still stand. They will help you to weather the bad times and profit from the good, and since predictions are usually the weakest part of investing, we urge you to stand by solid principles regardless of any predictions, no matter how sure you are of them. Well things seem to be shaping up quite nicely. Both the Dow and the TSX are up over 25% from their lows set back in October. While nothing is for sure, it is likely we have seen the bottom and that things are looking better now. Hopefully you have continued to follow our advice of holding quality and staying invested, otherwise you may have missed on the first pop of the recovery. Regardless, our advice remains the same. Build a diversified portfolio of high quality stocks and above all, stay invested. If that is what you have been doing, stay the course, you can use the inevitable dips to top up and the peaks to do a little trimming, but stay the course. If you have been out of the market, we warn against waiting for another dip or until you are sure that we are in a bull. The market could easily rise 20% before the next 10% pull back, and once you are sure we are in a bull, it may be about to end. So those approaches could be costly. At the same time, we do not suggest jumping in all at once. If you have stayed out, then start a regular investing program that will bring you to your objective investment mix over a period of time, perhaps two years. Then maintain the mix. While in theory it is likely that you would be better off to jump right in now, it is usually wiser to invest gradually over time. Markets never travel in a straight line, so investing gradually will allow you to take advantage of the regular setbacks that we will go through. Further, and perhaps more importantly, unexpected events do happen and can result in serious setbacks. Investing gradually will ensure that you do not do all your investing at a peak just before a significant pull back, which could be devastating, at least psychologically if not financially. So we believe that we are through the worst and that the markets are headed higher over the next few years. However, even if we are right, we are certain that the ride will be a bumpy one and that somewhere over the horizon are some serious drawbacks followed by some more bull markets. And that is how the markets manage to grow at an average rate of around 10% per year over the long haul. Have you had enough yet? Well we sure have, but while we believe the end of the bear is near, we are not expecting anything to happen fast. It is our suspicion that we are in the final testing phase of the bear market. To be honest, we expected a quick dip at the end of 2002 followed by a long but volatile upward journey. Well, the year 2002 ended stronger than we thought it might and 2003 is unfolding slower than we had hoped. Chances are that world events over the next while will be a major factor. A quick decisive war in Iraq could put all this behind us. However, if things remain uncertain, than nothing is likely to happen fast. These are truly interesting (if not disconcerting) times. Eventually the economy will improve and corporate profits will rebound. This will result in higher share prices as ultimately a company's long-term profitability is reflected in its price. In the short term, anything can happen. However, in the long term, on the whole, the best companies will prosper and so will their owners. The thing is, it can take a lot of patience to get there. We believe that those with patience who stick with our IFC investment principles will eventually be rewarded and glad that they did. Many of those who do not follow (and stick to) a similar philosophy, or who allow themselves to be scared out of their best stocks, will ultimately be dissatisfied with their investment experience as they will probably have managed to buy high and sell low. It is not entirely clear where the market is right now. We believe that it has tested the July lows and set new bottoms before starting to recover. However, maybe we are wrong and by the time you read this the market will have sunk even lower. Or maybe we are right and a bottom has been set and it is uphill from here. In either case, it will not be the first or the last time that we got it right or wrong. Actually we have a history of calling bottoms prematurely. So far in this bear market this is the third time we have called a bottom, but here is what we are very sure of. The market is low and it will eventually recover and move on to new highs, most likely climbing a wall of worry. It will probably be an uphill battle with trials, tribulations and setbacks along the way. In fact, years from now when we study the charts of the 1990's and the first decade of the twenty-first century, this bear will resemble a setback, maybe a major setback, but a setback in a much larger bull market. This leads us back to our standing advice that we believe is especially important right now. First and foremost, balance your portfolio according to your personal circumstances. Ignore the market or timing as in the long run they will probably cause you to buy high and sell low. So decide what your mix should be and stick to it. Remember, at times like this when markets are low, it is a result of people being more interested in selling than buying, and when the market is low they should be buying not selling. It is fair to say that it takes a lot of courage to buy low, which explains why the majority are often wrong. Stick with quality companies. While we believe that a recovery is imminent, many of the lower quality companies will be left behind to either fail or survive but never amount to much. Regardless of where the market goes, a portfolio of speculations is just that, a portfolio of speculations that might come true but most likely will wither away. Diversify, diversify, diversify. We will say it again for good measure, diversify. It is highly unlikely that all sectors or geographic regions will recover together. Different sectors will recover at different rates and times. If you stay diversified, chances are you will always hold some stocks in the right area. We have seen this in the last couple of years. While the markets have dropped approximately forty percent from peak to bottom, some sectors and some companies have gained and some have dropped a lot more than forty percent. There is no telling which ones will move first, but rest assured, the more certain we are that we know what will move next, the more certain we are that we are wrong. On the same thought, we must warn you about being overweighted in technology stocks. While it is prudent to have some holdings in this area, we are concerned about the general preoccupation with when technology will recover. This is only a small part of the market and should be reflected as such in your portfolio. Further, even if the market recovers, technology might not recover with it. Our suspicion is that a technology recovery could be years away and that it may not include many of the companies that currently make up that sector. Finally, there is our final principle, to invest regularly and gradually. A disciplined investment program will help you to build a sound portfolio over time, taking advantage of opportunities and limiting the damage caused by the inedible market peaks. They say it is darkest before the dawn. In the markets this and the opposite scenario are often true. Let us start with bull markets. They will often build to unrealistic heights ignoring all the danger signs. This is what happened a couple of years ago, especially in the case of technology stocks. People just could not wait to buy them. There were a few of us continuing to warn against some of the investments that just bared no logic whatsoever. Then in our first issue of 2000, just before the beginning of the collapse, we discussed many of the similarities to other past collapses. That issue can still be viewed by taking this link to the January 2000 issue of Financial Insight. What often happens is that the market gets hotter and hotter with all facts, warning signs and reason being ignored. Then when the most pessimistic bears decide they cannot stand being left out any longer and jump aboard, reason suddenly prevails. Usually as a result of some major event or series of events, which cause the markets to start to slide. This can happen quickly or gradually. Eventually people start bailing and selling. Then over time the attitude becomes so pessimistic that no matter how good the news, the markets read it all as bad. Sound Familiar. We believe that we are at the point where the markets are irrationally pessimistic, which makes for a good buying and/or holding opportunity. It is at this stage where markets bottom out and eventually change direction. It can happen quickly or slowly. In this case we expect a slow reversal of the trend and it may be very subtle. Then one day in about a year, we will suddenly realize that the turnaround has happened and that the recovery is well under way. Then over the next few years we can go into the next round and do it all over again. What is an investor to do? Again, nothing changes. Build a well-diversified portfolio of high quality stocks, balanced with safe securities (high quality bonds, GIC's T-Bills etc.) in such a way as to suit your personal circumstances. The balance should suit you, not the market nor your financial advisor. Quality is as important as ever, as crap is still crap. Sound companies with a good earnings history, good prospects and good management will weather the storms and prosper in the good times. Poor ones will usually fail, not necessarily immediately, but eventually. Finally there is the diversity issue. Different sectors, different regions and for that matter different companies tend to prosper at different times, and the timing has a funny way of surprising us, so diversify. You might say this is a stock pickers market. Some stocks seem to be taking off while others are just getting beaten up. On the whole we have seen some overall strength. At the same time, this strength is coupled with extreme volatility making it hard to get a fix on where things are going. Our expectation is that this will continue for some time and in a year or two most prices will be higher than they are now. Of course, as we have seen in the past, that year or two could easily wind up being stretched into a much longer time period. Over the long run, which is what counts, there is a lot of reason for optimism. Increased globalization, maturing baby boomers, improved efficiencies and decreased tax rates will drive the economy on to bigger and better things. Where we are going is not the major question, it is more a matter of at what speed and the route that we will take, and the route is bound to be choppy. So what is the best strategy? Overall, we recommend that you stick to our four IFC investments principles as in the long run we expect they will serve you well. On a more micro base, we have been using this strength as an opportunity to dump some of the stocks we no longer like or are not as fond of. This is also freeing up some cash for future opportunities and providing cash to pick up or increase our holdings in a few stocks that we do like but have been showing some weakness. However, this is only tinkering as our core portfolios are remaining in tact, and this tinkering is after all something we do anyway as opportunities present themselves. The first year of the new millennium will not be easily forgotten. For many of us it was year with some great changes but will unfortunately be remembered as a year of personal (non-financial) loss. While this was true for us, based on the Christmas letters that we received from family and friends, it seems that this was true for many others as well. On a global scale, it was the year the world changed, or maybe more accurately, the year the world awakened to the seriousness of international terrorism. On the positive side, it may be remembered, and we hope it is remembered as a major positive turning point in global co-operation and unity. On the financial side, it was the second year in a row where the Dow declined about 6 percent and a year where the TSE 300 declined about 14 percent, although some of us did managed to end on the upside. This leaves us with the question; how did the year 2001 measure up historically? In our May & June 2001 issue, we posted some charts of the last couple decades and noted that for the most part we were in the middle of an upward sloped trading channel. We indicated that in our opinion, in 2001, the Dow Jones Industrial average could drop as low as 8,000 without breaking out of the channel. It is interesting to note that the Dow bottomed out in 2001 at 7927. We have redrawn the chart, again using Big Charts (see link in the Interesting Links section below) and note that the Dow has now climbed up to just the below the middle of the channel. We also noted that for the Toronto Stock Exchange, based on the last decade (the information available using Big Charts) that depending on how you draw the line, the channel might have been broken a couple of times, but in the end, prices returned to the channel. We also noted that from late 1999 to mid 2000 a bearish head and shoulders formation was created, which suggested that the TSE 300 could drop to the mid 6000 range, but even that would not break the channel. It is interesting to note that the TSE 300 bottomed out at 6513 in 2001. We have since redrawn the chart and find it interesting to note that the way we drew the lines suggest that the TSE did briefly fall slightly below the support line but that it closed the year in the bottom quarter of the channel. So, where do we go from here? We believe that the charts support our position that nothing has changed. From a market and economic perspective, nothing unusual has happened. Both are growing, but there will always be ups and downs along the way, and some of them will come as complete surprises, while others will sneak up on you and by the time you recognize them, it will be too late. Overall, ten years from now, the last couple of years will blend into the charts and appear as just another blip along the way. In the short run, we believe that we are experiencing another one of those buying opportunities that keep cropping up, however, remember, "It is really a market of stocks, not a stock market." Many companies will flourish, and in the long run, most of the quality ones will, while many of those of lesser quality will eventually disappoint you. Also, even with the good companies, the road will not be a smooth or totally predictable one. So our advice stands. Stick to our four IFC Investment principles. As hard as it may sometimes be to do that, we are confident that in the long run you will be glad you did. We know we have been. What a month September was. We believed that we were going through a bottoming out process, then like everyone else, on Tuesday September 11, we woke up in disbelief about what had happened. Once we absorbed what happened, we expected that when the markets opened, they would drop about 10 percent more in a panic sell off, as some investors would have to get out of the market. So far, that is pretty close to what happened. Now we expect that things will be extremely volatile for some time with the new market lows being tested at least once and maybe a few times. However, for the most part, the underlining factors that are powering the economy are still intact. The baby boomers are in their peak earning years, are eliminating their debts, saving and spending. Many governments have eliminated their deficits and are starting to pay off their debts. We are in, and likely to stay in for some time, a low inflation, lower tax and low interest rate environment. Finally, we are moving into a very global market that has and will continue to improve the standard of living for people all over the world. Many feared that after September 11, the world borders would be closing. We doubted that all along, and we believe that the early indications point to an increased commitment to open markets, especially within North America. For a short time, cross border activity will be slowed, however, we expect to see increased trade, with tighter security in the long run. The simple fact is that we (all nations) need each other, can help each other and in the long run will improve each other's standard of living; a fact that does not seem to be lost on most of the world's leaders. As for Canada, while we would prefer this were not the case, in the Eastern United States, one way or another, there will be some massive construction projects going on for some time. These projects are bound to require a lot of Canadian resources, including technical, personnel and physical. Simply put, Canada is an important part of the solution, not part of the problem, and the powers to be in both Canada and the United States recognize this. Will the recent events have an enormous cost to society? Of course they will. This was truly a disaster. Should we all feel greatly grieved by the events? Yes, and we are. However, we will get past this and move on to better things. There is also an opportunity here. We are seeing a degree of global unity, co-operation and support that is unlike anything we have ever seen. While it is unlikely that we can stamp out bigotry and hatred, and to some extent recent events will fuel them. There is a genuine opportunity to significantly reduce them and promote human unity, cooperation, support and trade. So what is an investor to do? First and foremost, do not panic. You are bound to be holding some investments that will be genuinely hurt by recent events. However, the damage is done and chances are that the market has over-reacted, so sit tight. If you are holding a balanced and diversified portfolio of high quality investments, then you should weather the next while with limited short-term damage, and little or no permanent damage. If you have excess cash to invest, we believe that over the next while we will experience an exceptional buying opportunity. Just be sure to stick to our IFC investment principles and put a little extra emphasis on quality. It is hard to wake a sleeping bear, much less turn it into a raging bull. It was not that long ago that we were saying that there was no slowing this raging bull, but that sooner or later there was bound to be a correction. More recently, we found ourselves warning about being overweight in hot technology stocks. At the time it seemed that everyone was into them and convinced that there were fortunes to be made in technology and the Internet. All you needed was a story, no need to worry about troublesome things like profits. It seemed that we were continually warning that this approach would end in disaster. However, the masses knew better and we were out of touch. Then along came the year 2000, slow talking, smooth walking (or something like that) 2000, and the millennium ended with headlines like Tech Wreak 2000. Now what concerns us that there are two new distinct groups, those that are swearing off stocks (AGAIN?) and those that are waiting for the next technology rally. In the long run, both of these are attitudes that will rob you of good returns. Those who are swearing off stocks will be selling when they should be buying or holding, which will rob them of the sound long term returns that a good stock portfolio should provide. But it gets worse, many of them will repeat the cycle by not being able to resist and jumping in again at the next peak. Those who are waiting for the next tech wave are also making an error. There may be many other sectors that come and go before the technology stocks have their turn. Not to mention that this approach might keep them on the sidelines until the next peak. Also, the biggest benefactors of technology are usually those who use the technology, not those who produce it. After all, if no one benefits from it, then it must be worthless. Right? And then there is that pesky thing called profits. Like it or not, that is what companies are in business for, and in the end, despite short term fluctuations, that is what will drive stock prices. So here we go again. Funny how our market discussions continually lead us back to our four IFC Investment Principles. Soon, this bear market will wake up and turn into a bull. Soon might not be for a couple of years, however, we think that by the end of the year the markets will be higher than they are now and that by next summer, the bull will be raging again. We also want to remind you that on average, sound long-term returns of 8 to 12 percent are what a reasonable investors with a well-balanced portfolio of high quality stocks can expect. So you can chase rainbows if you like, but we believe that if you stick to our four IFC Investment Principles and keep your expectations reasonable, in the end you will be a successful investor. We believe that we have seen the worst of the recent set backs and that the market is presenting us with a buying opportunity. Possibly one last opportunity before the bull takes over again. We think that by the end of the year the economy will be growing again and that the economic expansion of recent years will be back on track. Having said that, we must change our position on the actions of the U.S. Federal Reserve. As recently as March, we were calling for cuts in interest rates and expressing a concern that the Fed might be moving to slowly, as it takes in excess of six months for interest rate moves to filter through the economy and have an impact. We still believe that they were overzealous in raising rates last year, and slow to change direction after the damage had been done. However, we suspect that with the actions taken so far, plus other factors, six to twelve months from now the economy will be moving right along. If we are right, and interest rates are cut further over the next few months, then the economy may become over stimulated in 2002 and tightening will become necessary to slow the economy. Therefore, while it is important for Federal monetary managers to react by adjusting interest rates, since the impact of their actions takes so long to filter through the economy, it is equally important that they do not overreact. As for the market perspective, we have indulged ourselves in some technical analysis of the markets and found some interesting results. Note: The next few paragraphs refer to some charts that we have created using Big Charts. To view these charts in a separate window, right click this link, then select "Open in New Window." A link has also been provided to Big Charts web site, in the Interesting Web Sites section of this letter. First, using Big Charts we created a chart of the Dow Jones Industrial Average since about 1970. You will note that we drew a long-term line of resistance and support on the chart. Resistance is a point where prices cannot seem to go any higher while support is a point where prices seem to stop going down. These two lines form a trading channel that has been maintained since about 1978. As you can see, we are currently in the middle of the range of the channel and the Dow could drop as low as 8,000 without breaking out of it. So, while we seem to be going though a significant correction, the chart shows this to be a fairly mild correction after a significant expansion. As a matter of interest, the slope of this channel represents an average growth rate of approximately 13% per year. Historically, this is an exceptional return. Next, using Big Charts we charted the TSE 300 from 1992 to current. We could not go as far back as Big Charts only provided information back to mid 1991. Here again, you can see a trading channel that started around 1992. Depending on how you draw the line, the channel might have been temporarily broken a couple of times, but in the end, prices returned to the channel. We also noticed that from late 1999 to mid 2000, a head and shoulders formation was created. This is a bearish formation that in this case suggests that the TSE 300 could drop to the mid 6,000 range. So far it has dropped to about 7,400. However, even a drop to 6,500 would not necessarily break the channel. Therefore, while the market has been seeing some wild gyrations lately, as you can see, it has not broken its general upward trend and is not showing any signs that it is likely to either. As a matter of interest, the slop of this channel represents an average growth rate of approximately 12% per year. Again, an exceptional return from a historical perspective. The final chart prepared using Big Charts, shows the Nasdaq Composite from 1974 to present. It shows a very definite trading range from early 1975 to present. Except that in 1990 it temporarily dropped below the support line then in 1999 it significantly broke the resistance line. However, as can be seen by the chart, neither breakout was sustained. Now the Nasdaq is back in the same trading channel that it has been in for about 26 years. The Nasdaq could fall as low as 1,500 without breaking out of this channel. As a matter of interest, the slope of this channel represents an average growth rate of approximately 13% per year. Again, historically, this is an exceptional return. So as you can see, we seem to be in a very healthy long-term trading channel. Yes there are severe gyrations and rotations in and out of sectors. While the timing of these is near impossible to predict, the overall long term result seems to be very steady. So once again, we must continue to stress our four IFC Investment Principles. If you stick to these principles and avoid trying to pick the next hot sector, stock or short-term trend, we believe you will do very well in the long run. For the longest time it seemed that nothing could stop the market. There would be dips from time to time, but before you could take advantage of them, they were gone. Now we are seeing the flip side. We keep seeing slight signs of a rally, only to be disappointed again. Nearly everybody seems to agree that this is a short term slow down in the middle of a long term growth cycle, however, the news just keeps getting worse, and the end keeps getting a little further away. So when will it end. We warned last year that this might happen. We said that all the fed tightening would be slow to take effect and was likely to be the wrong action, as high-energy prices would probably have a slowing effect, not a long-term inflationary effect. We think that the effects of last years tightening are not fully through the system yet. We also believe that energy costs have peaked. However, it takes a long time for increased energy costs to filter through the economy, and that process is not complete yet either. Considering this and that the fed has been slow to ease its monetary policy, we suspect that a turn around will not be seen till late in the year. Having said that, remember it is always darkest before the dawn. When all hope seems to be lost and everyone seems certain that we are in for a continued recession, chances are you are seeing the best signs of a turnaround. So all this bad news may not be a bad thing. We think that a year from now all this will be forgotten and the record expansion will be continuing again. Actually, the only thing we are not sure of is the timing part. We are very confident that the current doom and gloom will end, it might happen tomorrow, or maybe not for two years, but probably not for a few months. In the mean time, we are being presented with a buying opportunity, although, it is our belief that it is nearly always a buying opportunity for something. So our approach stays the same. Or as one good friend often says to us, "Nothing Changes." Stick to our four IFC Investment Principles and do not let the current situation dictate your strategy. A good quality balanced diversified portfolio is still the best way to go. We must confess that we are taking a little satisfaction lately. All around us is the news about what a dismal year it was especially for technology stocks. We note that the headline on the Report On Business section of the Globe And Mail on January 1, 2001 was Tech wreck 2000. This is similar to most of the news that we have been hearing. We take some satisfaction for a couple of reasons. First, at the beginning of the year 2000, all the news was about how great the market was and how everyone was making a killing in Technology. The attitude was that all the rules had changed, and that people like us who stuck to their guns and applied the old rules were just being foolish and ignoring the new realities. We must admit it was not easy sticking to those guns, let alone publishing our position. Essentially our position was that the old rules did apply, that many of those who ignored them would get burnt and that it was as important as ever to stick to our four IFC Investment Principles. So we must confess that we feel vindicated. To see what we actually said and read our recommendations from our January 2000 issue, you can take the link from the index above to our repost of last January's issue. Second, there is the satisfaction of success. In 2000, the TSE went up about 6%, the DOW dropped about 6%, the S&P 500 dropped about 10% and the Nasdaq dropped almost 40%. These numbers explain the headlines we have been hearing. However, we are happy to note that while we will not reveal the details, all our portfolio's made money in the year 2000 and our personal portfolio had a return of about 26%, with a three year average annual compounded return of over 15%. Compared to Canadian Equity mutual funds, that put us in the top 5% for the year and 10% for our three year average annual compounded return. Needless to say, we are pleased that we were foolish enough to stick to our principles and bucked the trend. Enough about us, let us take a look at where we have been and where we are going. Historically, on average, stocks return about 10 percent per year. So over the long term, this is the sort of return you should expect from your stock portfolio, less a couple of percent for mutual funds to cover the management expenses. This may sound low, but in times of normal inflation of about 3 percent, it is about three times the rate of inflation, and triple the rate of inflation is nothing to scoff at. Actually, we would prefer to make 10 percent with 3 percent inflation than 18 percent with 10 percent inflation. We should also expect a lot of volatility. You cannot expect to get 10 percent every year. Many years, maybe even most, you get over ten percent which makes up for the years when you lose money. In the end, an average of 10 percent per year is a reasonable expectation for a stock portfolio. In that light, 2000 was not a good year, but certainly something to be expected. The following link is to a chart showing the TSE 300, Dow Jones Industrial average, Standard & Poors 500 and Nasdaq composite index year-end closes for the last 7 years. We choose 7 years because at a 10% return an investment should double in about 7.2 years. As you can see, the last seven years have been phenomenal. Historically speaking, this has truly been an exceptional period, even after the Tech Wreck 2000. Add one to two percent to the TSE, DOW and S & P for dividends and the returns are even more impressive. Most of the shares in the Nasdaq do not pay dividends so the above return pretty closely matches its total return. We expect that technology will continue to drive the future, as it has for generations. However, it is not always technology companies that benefit from technology. The biggest benefactors are usually the companies that use the technology, not the creators of the technology. After all, the technology only has value if someone can use it to their advantage. Also, the rate of technological advance suggests that a new breakthrough can easily become obsolete before its creators can reap the rewards of creating it. In the future, we expect that there will be an ongoing rotation where different sectors and companies will move in and out of favor. This means that if you can pick the right sector at the right time, you will make a killing. However, as we have said before, there are more ways to be wrong than right, and if you get it wrong, you will likely eliminate any gains you made and probably lose money in the process. However, picking good companies with good prospects is a realistic objective. If you do that, most of your picks will probably make you happy in the long run, as long as you hold on to them. They may not always move the way you expect them to, but overall the direction should be the right one. Who can ask for anything more? So we are long term bullish and if you have not guessed, our standing advice continues to apply. Stick to our four IFC Investment Principles, in the end we believe you will be glad you did. The following are some of the statements that we made near the beginning of the year, when there seemed to be no stopping the market, especially the high tech sector. At the time, many people could not wait to get into the market and make their fortune in technology stocks. "There are also some that claim that the world has changed and that the old methods of evaluating stocks no longer apply. They are what you might call the flip side of the doom and gloomers. They believe that the tremendous rates of growth are sustainable, and that it is a mistake to apply the old measures to the new economy and especially the new technology. They believe that this time it is different. Well we have heard that before, and it is not. We are not even leaving room for discussion on this. The basic rules still apply, and those who choose to ignore them will get burnt. This is not to say that PE's cannot be higher, but we have already discussed that. Nevertheless, there are certain rules that always apply, and we have seen nothing to change them. These are rules like; Companies cannot carry unlimited amounts of debt, or a stock's price will eventually reflect earnings." The late 1970's when gold was over $800 per ounce. Around 1980 in Calgary when real estate was booming and people claimed that no one ever lost in real estate. Around 1981 when Dome Petroleum was the darling of the Canadian oil patch. Around 1986 when Japan stocks were all the rage. The first half of 1987 when equity mutual funds were all the rage. In the mid 1990's when Bre-X was the hottest stock in Canada. The early 1990's when the emerging markets were all the rage. We went on to point out, that technology stocks were all the rage and that many people were claiming that traditional valuations no longer applied. We stressed that technology has always changed the world and would continue to and that this was nothing new. We indicated that, as in the past, there would be setbacks and that a 20 percent correction was very likely. We pointed out that sooner or later many people will get burnt by those hot technology companies, that we expected that there would be some sector rotation in the future, and that our four IFC Investment Principles were as important as ever. "So what will change demand? Well it could be a gradual shift, or happen all of a sudden. The sudden shift could be a result of a change in the fortunes of a couple of major players. For example, there are several companies that are very hot, have never turned a profit and have no idea when they will. They are in effect concept stocks and not profitable companies. In the most important cases, they have sales, and sales are growing, (and so are loses), and unfortunately, thanks to investor enthusiasm, they have very large market capitalization's, so they significantly influence some market indexes. As long as investors are enthusiastic things will continue nicely. When they need more money they just issue more stocks. Who needs profits, or debt for that matter? However, sooner or later they will disappoint investors, as all companies do from time to time. This could be because losses are greater than expected, sales do not rise as expected, or strangely enough, because they turn a profit, and the notion of reasonable profits suddenly kicks in. When this happens, the shares of the company in question will fall significantly, perhaps collapse. This will put the company between a rock and a hard place. They will need cash flow, but it will not come from operations that are losing money, they cannot issue more shares without further hurting the share price and no one will loan them money. The result could easily be bankruptcy. All it would take is for the above to happen to a few, or maybe to one or two of the right players, and investor sentiment could change overnight, which would greatly effect the demand for these stocks. Or we might be witnessing a gradual shift already. " The above description shares remarkable similarities with what has happened since then. Actually, all of the above concerns did happen to some extent this year. This is not surprising, as history tends to repeat itself and as long as greed and fear drive the markets, one should expect more of the same. So what has happened over the last year (January 1 to Dec. 8, 2000)? The Canadian markets have done very well. The TSE 300 finally broke 10,000 and went on to peak at 11,402 around the end of the summer. It has dropped 16 percent since then to 9549, but it is still up 13 percent so far this year. The Dow Jones Industrial average peaked at 11,713 in January. Since then it has declined 9 percent to 10,713. For the year it is down 7%. The Nasdaq peaked in March at 5133. Since then it has declined 43 percent to 2917and is down 28 percent for the year. This is very bad for those who got in near the top, but not so bad for longer-term investors. The Nasdaq composite index has risen a total of 33 percent since January 1, 1999 (23 months) and a total of 85 percent since January 1, 1998 (35 months). So the question as always is; where do we go from here? Well we expect that the year 2001 will be a good one and probably yield more normal returns in the 10 to 15 percent area. There will be ups, downs and some rotation, but at the end of the day (a year, maybe two but possibly 5), order will be restored, and the market will be fueled by growth in the economy and in earnings. And of course, just when you think you have it pegged, the market will humble you. The conclusion: Do not get too concerned with the market's day-by-day gyrations. If you stick to our 4 IFC Principles and focus on the long term, in the end you should do very nicely, and that, our friends, is as good as it gets. Just imagine that you were the captain of a super tanker that takes 3 miles to start a course change and 5 miles to actually make a significant course adjustment. Now lets say that you were at sea and the radar guy comes to you and indicates that there is a giant iceberg 10 miles ahead and you are headed straight for it. But you were dedicated to your cause and taking the most direct route you can; hang the consequences. Anyway, that is not for 10 miles, so you continue on your course. However, as luck would have it the owners of the ship decided that you needed a holiday, so at 8 miles before the iceberg they relieve you. Now the new captain takes some time to get a handle on what is happening, but at 7 miles to the iceberg he realizes that a course correction is required and at 6 miles he has determined a new course and started the correction. Just in time as it will take 5 miles to make enough correction to completely clear the iceberg. Things go along pretty good to the 3 mile point, when the owners get upset that the ship is not going where they want it to go, so they reinstate you, the original captain. Now you take some bearings and realize that the ship is starting to change course but still aimed at the iceberg. All hell breaks out and at 2 miles you start even greater corrective action that will not even start to take effect until 1 mile after the iceberg. The whistles blow and everyone scrambles as the ship has a near miss with the iceberg. A tragedy was adverted. One that you caused by ignoring the warnings 10 miles back and that the relief captain avoided by taking action 6 miles back. Things are good though, after all the tragedy was adverted and it looks like clear sailing ahead. You can now claim to be a hero, after all, the relief captain was sailing toward an iceberg that surely would have sunk the ship. Luckily you got back in command in time and avoided it. Now you can reset your compass and sail straight for your goal. Oh yes, remember the radar guy, well he is just a pesky nuisance anyway, so you fired him, after all, it is clear sailing from here on. Isn't it? The following table was compiled with information obtained from the Canadian Department of Finance web site. 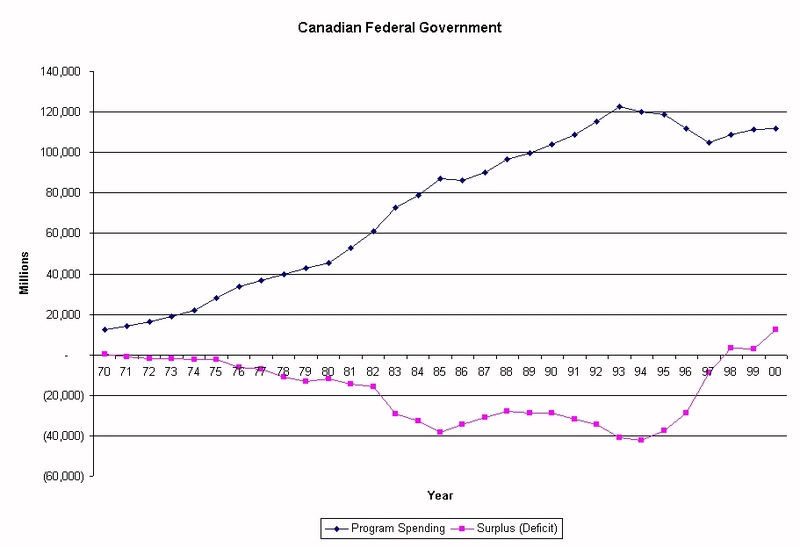 It indicates the Canadian Federal Governments program spending, Budget Surplus/Deficit at the end of each fiscal year (March 31) since 1970 and the Net federal Debt as of those dates. It also indicates who was the Minister of Finance on those dates. Now for the economy things have clearly improved and you can draw your own conclusions as to responsibility. While different governments have had some influence, the fact that many governments had enormous deficits in the 1980's and are only now turning things around would indicate that there are a lot of factors at work, some that governments can influence and some that they have no control over, although they love to take credit for the good things. Regardless of your interpretation of the past, that is now water under the bridge. The question is, where will we go from here, what lessons have we learned from the past, and do we understand how some things really are different? The second and third parts of this question are what worry us. Sometimes it seems that governments are trying to steer the ship by standing on the bridge with a pair of binoculars that only show a mile ahead. In the United States, the Fed has been constantly raising interest rates for fear of inflation. They are concerned that a runaway economy will create inflation that is pushed by wages. The basic theory is that as the economy improves, unemployment decreases, which is good, however, if left unchecked, it means more prosperity, increasing consumer demand that increases demand for employees and further reduces unemployment. Eventually, there is a shortage of workers and through supply and demand this pushes up salaries, which pushes up prices and creates an inflation cycle that eventually ends in recession. The approach used to control this is to raise interest rates. The idea is to tighten the money supply. As interest rates rise, cost will increase and hopefully slow industrial growth to a more sustainable level and advert a recession. No one can question the motives here, but our concern is that by overdoing it, the medicine might become the cause of the recession, rather than the cure. We must admit, we do not envy the Fed in this tightrope walk. Our first concern is that the economy is a very large ship and course corrections take a long time to show their impact. It has been said that it will take 6 months for an interest rate adjustment to filter its way through the economy. We would say at least six months. So by adjusting regularly, there is a very good chance that the last few increases were not needed and a concern that they may turn out to be overkill, doing more harm than good. The Fed's concern about inflation has also been heightened by concerns about high oil prices. While it is true that there is bound to be inflation caused by high oil prices, this is not part of the wage inflation spiral. We believe that it is more likely to have the same dampening effect on the economy that higher interest rates would have, thus slowing economic growth and doing the feds job for them. If we are right, further interest rate hikes would result in overkill at a time when they should have been lowering the rates to stimulate the economy and counter the effects of higher oil prices. Finally, there are several new factors that are driving this economy, and they are pretty much beyond any government's control. These factors include: Great increases in productivity being realized by mass computerization and the popularity of the personal computer. The baby boom generation finally reaching there peak production and earning years. The fact that the baby boomers are at the stage in life where they are eliminating their debt, and are starting to inherit vast amounts of wealth from their parents, a group of people who were likely the best savers in history. Further, there is vast globalization going on. For some time this will ensure a competitive work force and help stave off inflation. This globalization will increase the wealth of the wealthy countries (by reducing living costs) and help bring prosperity to many poor countries that are finally getting a shot at prosperity. This prosperity will further drive growth as these people who once lived in poverty will become consumers and eventually increase everyone's wealth even more. Yes, there are many moral and ethical bridges to cross, but there always have been, crossing them has always been and always will be a work in progress. However, great strides have been made and we are confident that while the path may not always be a straight one; it will continue in the right direction. We are not sure if this is a state of the globe, or a state of Canada address, but it does highlight many factors that have influenced where we are, how we got here and where we are going. The above analysis shows how there is a very good chance of a slow down in the next year or two, but that our overall long-term outlook is still very strong. This leads us to be even more convinced that our overall approach of sticking to our four IFC principles is still the right one. By being diversified and holding quality, we will be ready for any temporary down turn, and by being balanced correctly we insure that we will also profit from the long-term prosperity that we believe is ahead. The above brings up one other thought. When there is a down turn, utility stocks usually do well. This has been a neglected area lately, so it might be wise to review your portfolio to ensure that you are properly balanced in this area. We would not recommend being overweight in this or any other area, but if you are under weighted here, maybe it would be a good idea to correct the balance, something that is usually wise to do anyway. Well we seem to rocking again. For most of the year the U.S. markets seemed to have been lackluster, although the Canadian market has done all right. Now, all the markets seem to be advancing with the major ones starting to hit new highs, although the Nasdaq still has a ways to go to reach its old highs. Also, it is interesting to watch the Dow Jones Industrial average and the TSE 300 index, which seem to be in a dead heat, taking turns passing each other. However, what the indexes do not show is that the market is still two tier, with many stocks not participating in the rally. While we expect this to continue, it is hard to say which stocks will participate and when. Not to mention that the stocks that participate will change from time to time, probably just as soon as you think you have got it pegged. So while we are optimistic about the market in the long run, we continue to stress the importance of sticking to our four IFC investment principles. Following them will continue to enable you to build an overall investment portfolio that will help you hang in during the bad times while profiting from the good ones. For some time we have been recommending that Canadian investors should not overlook Canada. We expect that many investors ignored us and thought that we were naïve, after all, the real opportunities were abroad and a shrewd investor would invest as much as they could outside. In early 1998, it was suggested that we were nuts to go out on the limb and suggest that the DOW would break 10,000 in 1999 and that the TSE would break 10,000 in the year 2000. With this in mind, let's review the results. In 1999, the DOW broke 10,000 and went on to break 11,000 where it closed out the year. At the time, the TSE was still below 9000 and all the smart money was leaving Canada, despite our continued advise. However, half way through this year the DOW has settled back into the mid ten thousands and seems to be having trouble breaking 11,000. Meantime, the TSE has broken 10,000 and as we are writing this, it is making new records daily. By the time you read this, the TSE 300 index may have actually passed the DOW Jones Industrial index, something it has not done for some time. So if you do not mind, we would like to take a moment to pat ourselves on the back, and to pat you on the back if you stuck to our advise, after all, it was not always easy. So where do we go from here. We believe that while there are less opportunities in Canada than there were six months ago, there are still plenty of good stocks that have not met their potential. We also believe that many of those that have moved up significantly, still have a long way to go. Finally, it is just a matter of time until the DOW breaks 11,000 again and then starts moving on to new heights. So it is fair to say that overall we are still very bullish, both long and short term. However, there will always be spurts, setbacks, and droughts; and regardless what happens in the overall market, some companies will thrive while others disappoint. So as usual we must stress our four IFC investment principles. If you stick to them, we believe that in the long run, you will do very well. Authors note: Well the heat is on, between the time that we wrote this (July 13) and when we posted it (July 14); the TSE 300 passed the DOW Jones Industrial Average. We heard that the TSE 300 had been below the Dow Jones Industrial Index for 5 years. Up to the end of 1999, there seemed to be no stopping the market, especially the technology side. Then in 2000, it corrected and has entered a lower trading range. How long it will stay in the current range is anybody's guess, but in the meantime we are being presented with some buying opportunities. Eventually, these doldrums will end and we will see new market highs. This might not happen for a few years, however, we expect that it will happen before year-end, and it could even happen over the summer. On the other hand, we also expect that the market will be very two tier, with many stocks being left behind. For the next while (probably a year or two) investors will likely be a lot more quality conscious. Then there will be another hot market in some area. Which area will depend on how events unfold, the only thing that is almost certain is that by the time it is identified it will be too late and many people who are chasing rainbows will get burnt again. This leads us back to our long-standing strategy. If you are a regular reader, you can guess the rest of this paragraph. Stick to our four IFC investment principles. They will help you to take advantage of the good markets and to weather the bad ones. In some cases they will even help you profit from poor markets, as when the going gets tough, there is usually a rotation into the higher quality companies. This explains why our portfolios have been doing very well lately, despite the overall market's lack of performance. "There will be great opportunities in the future, well-run companies that develop or use technology skillfully will thrive, and those that do not will die. Our four IFC principles are more important than ever. We expect this bull to continue for a long time, however, all bull markets suffer setbacks. Most years we suffer three or four, often one or two are intense. Given the rate of recent growth, a correction of twenty percent is very likely, and a forty percent correction for technology stocks should almost be expected." On Friday, April 14, 2000, the TSE 300 closed at 8474, off 16.7 percent from its record high of 10,177. The Dow Jones Industrial Average closed at 10,306, off 12.3 percent from its record high of 11,750. The Nasdaq closed at 3321, off 35.3 percent from its record high of 5133. While we do not know what will happen next (although by the time you read this you may have an inkling), this appears to be one of those expected corrections that we referred to at the beginning of the year. Actually, we have been constantly warning of this kind of a correction and stressing our four IFC investment principles. We have done that because while this approach might not result in the best returns during the hottest markets, it will allow you to profit handsomely from whatever sectors are gaining and to maintain your wealth during the tougher times, which is what it has done for us, for a long time now. While updating our portfolios on April 15, we noted the following. For the first two weeks of April, the TSE 300 was off by 10.4 percent, the Dow Jones Industrials were off 5.6 percent and the Nasdaq was off by 27.4 percent. However, we were pleased to see that during that period, 40 percent of out portfolios were actually up, (albeit less than 3%) and of the rest, the worst performance was a loss of less than 3 percent. So, while during the hottest of times, we lagged the market, so far our portfolios have stood up through the worst of times. We like to say, "That is the difference that quality makes." So far this year the markets have been anything but calm. They seem to be rocketing in all different directions, and so far, the overall results are two tier. As of Friday March 10, 2000, for the year, the Dow Jones Industrial average was down 14% the Standards and Poors 500 was down 5%, the Nasdaq composite was up 24% and the Toronto Stock Exchange 300 was up 13%. This has lead to some very interesting analogies. Louis Rukeyser, host of Wall Street Week (a favorite of ours) this week in his introduction made a comment to the effect that you need bifocals to read the financial pages. Pat McKeough (our favorite Canadian author) has been referring to the difference between a bear market and a bear trap. He believes, as do we, that the recent setbacks are a bear trap, not the beginnings of a bear market. Finally, there is a lot of discussion about old economy and new economy stocks. First there were technology stocks, then dot-com, then Internet, then bio tech and now it is new economy stocks. There is definitely a trend toward new economy and out of old economy stocks. Even in Canada, the TSE 300 is up 14% but this is mainly because of three companies that due to their incredible growth now make up a very large percentage of the index. Even with the current high prices for oil, no one seems interested in buying petroleum companies. And why should they, when they can count on the almost sure thing of great returns in the new economy. Or is that also part of the trap. The new economy, which mainly refers to things like the Internet, communications and the like are definitely going to change the way we live and do business. People, money, information and resources will be better connected, more mobile and freer to go anywhere. Competition will reduce cost and improve the way people live. We believe that this is the greatest change since the industrial revolution and it may even rival that. However, this does not mean the end of the old economy or traditional businesses, in fact, we think it is quite the opposite. Sure, for some time there will be a lot of companies going great guns in these new economy industries. In time, many will pass away or get swallowed up by the enormous competition as everyone rushes to invest in these new businesses. This is not unlike other times in history. Around the beginning of the twentieth century, there were hundreds of car manufactures, only a few survived, but look at how the automobile changed the world. During the gold rush, masses of people rushed to stake out their claim, but only a few got rich. We expect to see a lot of similarities over time. The greatest benefactors will be the old economy companies that embrace and use new technology most efficiently and effectively. While the new economy is producing a lot of new products that people want to use, in the final analysis, its greatest impact will be in how it changes and improves the way we do things and business. People are still going to want to eat, drink, have nice shelters, live longer healthier lives, be mobile, travel, socialize, relax, partake in sports activities and learn. The new economy will not change this, however, it will improve how we do these things. First by making us (society as a whole) more efficient and effective and second by improving the way we do them. This leads us to the question of who is making the best profits. Many old economy companies are making record profits and growing their earnings at rates that they have not imagined for years. This is largely a result of the new economy. It is mostly because of new technologies that companies are able to move into new markets, bring their goods and services to people that in the past could not obtain them, hire people that at one time were doomed to lives of poverty and despair and to deliver goods at lower costs. This is also why we are seeing unprecedented growth without inflation. So the old economy companies are the biggest benefactors of the boom in these new economy companies; the ones that in many cases are not making money, but that investors cannot wait to invest in. How long this situation will last is anybodies guess, but sooner or later the tides will shift, and to be honest, while we cannot put our finger on any specifics, we feel that we are already seeing some early signs. So what is an investor to do? It is our belief that diversity is more important than ever. Usually, quality is our highest emphasis, and while it is still extremely important, we think that now more than ever diversifying among high quality companies is critical. There will still be a lot of success stories in the high tech sector, but there will also be some serious casualties. We think that the best way to take part in this is to hold a few of the very highest quality companies in this sector as part of a reasonably balanced portfolio. We also, recommend that you do not get overweighed in this or any sector. Then if you hold the rest of your money in high quality companies, in the so called old economy, some selected for their growth potential, some due to their value and some (maybe most) for a mix, you will be well positioned to benefit from any shifts that happen. In a way, while it will take some patience, you will get to have your cake and to eat it to, without exposing yourself to undo amounts of risk. There are several versions of the January rule, however, in general it says, "So goes January, so goes the rest of the year". Different analysis of the rule shows different degrees of accuracy. In general the analysis we have heard indicate that it has a fairly high degree of accuracy when it predicts a rising market and a lower one when it predicts a dropping market. All in all, it is probably accurate about 70% of the time. Of course when you consider historic returns, this is what you might expect. Historically, markets rise (on a year to year basis) about 70% of the time. So if you think about it, in theory, when a system predicts a rising market, it has a 70% chance of being right while when it predicts a dropping market, it has a 30% chance to be right. On the other hand, if you just predict a rising market all the time, you will also be right about 70% of the time. So while we enjoy reviewing the January rule, which we will do below, you can see why we do not put a lot of stock in it. For the fun of it let us look at January's results. In Canada, the TSE, whether measured using the TSE/S&P60 or the TSE 300, rose a little less than one percent. However, in the United States, the Dow Jones Industrial Index dropped 4.8%, the S & P 500 dropped 5.1% and the Nasdaq Composite, which looked all month like it would be up for the month, dropped 3.2%. This would indicate that Canadian Markets will rise and U.S. markets will drop. Funny thing, we would say that there is about a 70% or better chance that the Canadian Markets will rise and about a 30% chance of the U.S. markets dropping for the year 2000. What we think is more interesting is the high level of volatility that January showed. In fact, the markets were all over the place, and every time you thought it was starting to show some direction, either up or down, it fooled you and took a leap in the opposite direction. This high volatility is something that we expect to continue for some time. We expect that the year 2000 will show a lot of volatility and that for the year, all the major Canadian and U.S. markets discussed above will be up, however, not near the amount that they were last year. You should be looking for the more historic returns of about 10% per year. Some years will do better, which will make up for the worse years, but 10% is a realistic long-term average expectation. We continue to urge you to hold on to your Canadian stocks, as we think that there is a very good chance that Canada will outperform the U.S. for the next year or so. This will be a result of the Canadian Markets being better valued, which is a result of investment money shunning Canada in favor of other markets like the U.S., and the recovery of commodity prices that should be good for Canada's economy as a whole. We also note that there seems to be a lot of American interest in Canadian stocks lately and that it appears that a lot of Canadian mutual fund money has been finding its way out of Canadian funds. We would consider both of these to be positive indicators for Canadian Stocks. The U.S. interest is positive because even if only a small amount of U.S. Capital flows into Canadian stocks, it could have a significant impact on those stocks. We consider the Canadian mutual fund money flowing out of Canada to be a positive indicator because as a group, we think that this group of investors is likely to be wrong more often than not. One final point, as with all markets, there will be individual winners and losers, so diversification and quality continue to be important. This leads us back to our standing advise. Continue to stick to our four IFC Principles; in the long run you will be glad you did. This was a special issue, that described different events of the previous 20 years indicating similarities of previous train wrecks (so to speak) and how they were similar to what was then the technology/dot com boom. Then the issue went on to give a very long term forcast and our recommended course of action. The bubble finally showed weakness a few days after the original publication and burst a few months later. Here is a link to a reprint of that issue. We believe that it is worth reading again and that its message and advice are always timely. But that is just our opinion! The one thing that keeps surprising us about this market is how quickly it recovers. It seemed that as soon as October ended, the bull took its queue and started raging. In November the Dow broke 11,000 again, the Nasdaq started making new record highs, and the sleepy Toronto Stock Exchange finally woke up, posting its first new high since April 1998. We have been expecting all this, but we did not expect it until the year 2000. So what will happen next? At this point, we cannot say for the rest of the year. The bull could easily continue right through year-end and then on into the New Year. We expect that the year 2000 will be a good one, especially the first half. From all accounts, it appears that there is a lot of money waiting on the sidelines until after the year-end, just in case there is a Y2K disaster. Also, the economy seems strong, earnings are growing and in the United States, the year 2000 is a Presidential election year. All of these are usually positive for stocks. Things look especially good for Canada, as commodity prices are rising, and a depressed market is making for many great bargains. Something that is starting to be noticed both at home and abroad. Our advice stands. Hold a balanced portfolio of high quality stocks. There could easily be a year end correction driven by Y2K fears, but that seems less likely every day. We suspect that any money that was to be taken out of the market because of Y2K, already has. Either way, if we are right about next year, by this time next year, what ever happens in December, will have become a distant memory. We believe that the only ones with regrets will be the ones who strayed from our IFC Investment Principles. Of course, it is possible that we are wrong about next year, however, in total, over the longer term, markets have always gone up more than down, so it should be safe to say that avoiding stocks will be wrong more often than not. In the last two issues we said; "We cannot help but think that sooner or later the market will pause for a summer rest, then be followed by a fairly healthy correction, which could easily be fueled by a last minute Y2K panic." Well, it seems that the summer rest has happened. Now it will be interesting to see if there is a further pull back, a rally or more of the same. We still expect the DOW to end the year between ten and eleven thousand. So you might say that we are expecting more of the same. In Canada, commodity prices will be a major factor. If they hold up or improve, then Canadian markets will do very well. If not, then in the short run it is hard to say, although outside of the resource sector, there seems to be a lot of bargains in Canada. Canadian Markets on the whole have not done much for the last couple of years. Yet there are some great Canadian companies that are world leaders in their field, and are priced very cheaply by most standards. This suggests to us that the next while might be a good time to increase your holdings in high quality Canadian companies. It may take some time, but sooner or later, these companies will shine, and your patience will be rewarded, as long as you stick it out. So in a nutshell, continue to follow our four IFC principals, and if you are wondering where to put new money, do not overlook Canada, it may not be the in vogue place these days, but that may turn out to be a good thing. The rest of this year should prove very interesting. Will this bull just continue onward, will it go to sleep for the summer, or is a significant correction around the corner. The last few summers have had some fairly good corrections, then by the New Year; it seems that all had been forgotten. We cannot help but think that sooner or later the market will pause for a summer rest, then be followed by a fairly healthy correction, which could easily be fueled by a last minute Y2K panic. What we find most interesting is the current lack of discussion on Y2K. We thought for sure that the Doom and Gloomers would be out in full force by now. Regardless what happens over the next few months, it is still just a matter of time until today's high markets are just a distant memory of a time when the DOW was only in the 10,000 zone. It might be a couple of years, or it might be a decade, but rest assured that one day 10,000 will sound low. So what is the strategy? Well, when there are dips, you can use them to add to your holdings, and during the upticks you can thin some holdings, but on the whole, it is wise to stay invested. Most importantly, continue to stick to our four IFC investment principles. Maybe we are being a little lazy, but this month we feel exactly the same, so "dido". For a while it looked as if the DOW would never close over 10,000. Then it finally did, then it broke 11,000 and yesterday morning we heard one analyst call for the DOW to break 13,000 before the next major correction. It seems hard to believe that on February 1, 1998, a year and a quarter ago, we were going out on the limb by suggesting that the DOW would hit 10,000 this year and that the TSE 300 would hit 10,000 next year. Now, the first prediction almost sounds pessimistic, although the TSE 300 breaking 10,000 next year sounds like a stretch. Or does it? The DOW closed 1997 at 7908 and then broke 10,000 in early 1999 about 15 months later. The TSE 300 closed April 1999 at 7015. Is it unreasonable to expect it to break 10,000 in 20 months? We will know for sure on or before Jan. 1, 2001. The next little while should prove very interesting. There are bound to be two or three minor adjustments of 5 to 10% during 1999. The question is whether the bull will continue, flatten, or will there be a significant correction later this year. Our guess is all three. This recent run up does not seem to be slowing down, but by the time you are reading this, the DOW might be below 10,000 again. Or it could have broken 12,000. Here is what we expect. This run up will continue to somewhere between 11,500 and 12,500. There will be some minor adjustments, but sometime later this year we will see a more significant correction of between 10 and 20 percent, possibly fueled by a last minute Y2K panic. Where the DOW ends up on December 31, is anyone’s guess. We suspect in the 10,000 to 11,000 vicinity. Then we expect that the bull will continue next year, and then into the next century. We are also optimistic about the Canadian market. Actually, for the next year or two, we are even more optimistic about the Canadian Market than we are about the U.S. market. The recovery in the world economies will mean a recovery in most commodities, which ultimately will be good for Canada. Also, we are finding it relatively easy to find great Canadian companies that can be bought for less than we believe they are worth. While it is easy to find great U.S. companies, buying them at a bargain is increasingly difficult. As usual, our advice stays the same. If you stick to our four IFC Investment Principles, (listed below), in the long run you should do well, regardless if our predictions are right or wrong, but especially if we are right. We recently came across some interesting numbers in the “Report of the Task Force on the Canadian Financial Services Sector." With the exception of the last row, we prepared the following table with information from “Statistics Canada National Balance Sheet Accounts, Bank of Canada." which we found in the Task Force report. It appears that the size of both the world investment community and the world consumer base (as measured by number of people) are growing at unprecedented rates. It also appears that household financial assets have been growing at a fairly substantial rate. This leaves us to believe that over the long run, (measured in decades) there should be incredible amounts of money flowing into the investment markets and the potential customer base is also increasing. So there should be plenty of capital to fund new enterprises and to hold up the values of existing ones plus a lot of opportunities for businesses to sell their products and to increase profits. We believe that we are experiencing the beginning of what may be the greatest and longest bull market in history. If the above analysis is correct, it means that those bears who keep waiting for the bubble to burst, not only missed the great opportunities of the last few years, but if they continue to wait, they will miss even greater opportunities. Actually, it is conceivable that this big burst that they are waiting for will not happen, or at least, will not happen in their lifetime. The above is obviously a very long term outlook. We are not talking in years, we are talking in decades, and we may all have died before it can be determined if the above analysis is really correct. In the mean time, expect both the expected and the unexpected. There will be years of exceptional returns. There will be some massive sell off’s, probably starting when confidence is at its highest. There will also be some normal years, but in the long run, ten, twenty, thirty, forty years; we believe if you stay invested in equities, as long as you follow our basic IFC Investment Principles, you will be glad that you did. What about the short run? Well, we think that there is likely to be a Y2K panic sale later this year. That sale will probably drop the market between ten and forty percent. Then at some point, likely early next year, when it is evident that the world did not come to an end, well, hang on to your socks. Then again, in the short term, markets can be very fickle, so you had best follow our principles and concentrate on the long term. Before we talk about the market and the future, we thought that this month, it might be a good idea to discuss how we got to where we are. In the 1940's, the second world war ended. This started something that would have an enormous impact on the decades to come. The North American baby boom. There was new hope in the air, and the world was to be run by a group of people who knew how to survive hard times, were prepared to work hard to better their lives and who would save whatever they could. In the sixties, a new generation was growing up, the baby boomers. A generation that had not known hardships like the depression or the war. This generation saw prosperous times ahead, although it did live in the shadow of the cold war. They could see where the success of the generation before them had some dangerous implications and in their youth they embraced a concept of peace, love and self fulfillment. Then they became adults, the working class, and started to have families. Not knowing the hardships that their parents knew, this generation did not save the way their parents did, instead they borrowed for homes, cars, vacations and many other things. They also demanded excessive services and safety nets from their governments. The governments provided these things by borrowing. All this put a large demand on the money supply. This in turn drove interest rates and inflation to unprecedented levels. In recent years the baby boomers have moved on to a new stage. As they reached middle age, they started to realize that retirement was not to far away, so they should save. Second, they were beginning to hit an age where their earning ability was maximizing, plus their children were starting to leave the nest, so they had more ability to save. Also, while governments are taking credit for reducing their debts, what really happened is that due to the age of the baby boom, they were collecting more taxes, spending less on interest and facing less demand for services. All this is resulting in more money to be loaned or invested with less demand from borrowers. This in itself should reduce inflation and interest rates, but there is more. We mentioned above the savings of the baby boomer's parents. That generation is now just starting to die off, and they will be leaving their children enormous wealth. Of course there are some who will not inherit much while others inherit a fortune, but most baby boomers may be surprised at what they receive. Consider what is probably a fairly average family with three children. The parents die leaving about $250,000 of investments, pension and insurance, plus about $50,000 of other assets and a $200,000 home. Each child inherits about $160,000. Chances are the children (baby boomers) now have their house nearly paid off, and have some savings of their own. So their savings and investment power is boosted even further. Then there are some other implications. The opening up of the world economy, the fall of communism, the future prospects for many third world countries and the advent of the euro should create, and is creating an environment where significant global growth and low inflation are likely. Add to that the impact of computers and automation, which are really just starting to significantly impact efficiency, and the opportunities for business are mind boggling. Actually, deflation could result and be a good thing, as it would be the result of improved productivity and competition rather than a shrinking economy. In the past, deflation has been feared because it was associated with the declining economy of the depression. However, in the future, we might see a growing economy fueled by deflation. This could happen if improved technology and efficiencies reduce the resources required to produce goods and services. Then, if an entrepreneurial spirit is embraced, the entrepreneurs might put the freed up resources to work, creating new goods and services, which would further grow the economy. This would create even more opportunities and improve everyone’s standard of living. Then again, if the governments try to control things, protect their weak industries, build walls around their countries and squash this spirit, the future will not be so rosy. While that is likely to happen in some countries, we believe that with the current world globalization, few governments will be able to maintain that approach. So what does this mean about future investing? Well, as you have probably guessed, we are still bullish about the long term. However, the road will be a rocky one. There will probably be plenty of opportunities and plenty of capital to keep the markets and business growing. However, there will also be many losers. Further, we cannot stress enough the you must keep your expectations reasonable. While there will be years of double digit returns, over the long run you should expect single digit returns. Historically, stocks have averaged about 10%, so that is all you can reasonably expect from them. If inflation and interest rates stay low, then there is all the more reason to expect single digit returns. Then again, if inflation is around 2 percent, and fixed income investments such as bonds are yielding about 4 percent, why should you expect double digit returns on your stocks. Actually, in this scenario a return of 10 percent is more than double the return of bonds and five times the rate of inflation. Pretty good when you think about it. What a year 1998 was. It started with a continuation of the great bull market of the 1990’s. Then, just when it seemed that there was no keeping it down, we saw a quick and severe correction (a technical bear market in Canada and within one percent of a technical bear in the United States). It must have been the shortest Bear in history, because it seemed that before the bear market prophets had a chance to announce that they were right and the world was coming to an end, the Dow was making new record highs again. There just does not seem to be anything that can keep this bull market down for the count. Then again, the TSE 300 was down for the year, albeit only 3 percent, and for many Canadian Investors, especially those overweighted in resources, or who came into the market around April, or who got out after the correction, 1998 may be a year that they will want to forget. If you have been invested in a diverse portfolio of high quality stocks you probably made a small loss or gain on your Canadian equities and did very nicely on your U.S. equities. If you were also applying a dollar cost averaging approach (of investing a regular amount every month) and you stuck to it, you probably faired quite nicely in 1998. Maybe you did not get double digit returns, but a return of ten percent is the historic average, and considering the level of inflation and interest rates in both Canada and the U.S. even a small return is nothing to scoff at. We cannot be certain about any given year, except the ones in the past, but historically, equities have returned an average of about 10 percent a year. It is probably fair to expect that average in the future. We believe that 1999 will start out strong, and that the Dow will break 10,000 in the first half of the year. Then, at some point we expect investors will start to get nervous about the effects of the Y2K bug and we will see some weakness. Depending on the overall market sentiments and emotions, this correction could be mild or very severe. By the end of the year the markets will likely be up about ten percent, unless there is an over reaction to the Y2K problem. We also expect that in early 2000, once people have seen that the world did not come to an end, the bull will continue. Also, at some point in the future, resource prices will start to recover, and when they do, we expect the Canadian market to outperform the U.S. market. Until then, they will probably more or less shadow each other. So our advice continues. Stay balanced according to your personal circumstances, not your market expectations. For your equities, hold a diverse portfolio of high quality stocks or mutual funds. Continue to add to your holdings, especially during times of market weakness. However, in the next year or two, we cannot over emphasize the importance of being well diversified and holding quality. While we expect that in the long run, the Y2K bug will only be a blip, companies that do not prepare properly will be seriously hurt and some will go out of business. Holding quality reduces your risk significantly, and being diversified helps ensure that no one company can impact you too greatly. If in July or sooner, you had said that in November, the DOW would be hitting new highs, we would have said that was quite possible. By the end of August, we would have laughed and said that the DOW will hit new highs, but not likely that soon. Well, it happened sooner than we thought. Actually, November makes our prediction (first made in February 1998) that the DOW will break 10,000 in 1999 seem likely to come true. The DOW closed November at 9117 and only needs to increase 10% to make 10,000. Unfortunately, the TSE breaking 10,000 in the year 2000 (a prediction we made at the same time) is looking less and less likely. It is still possible, but it requires that the TSE 300 advance 57% over the next 25 months. Historically, stocks return about 10% per year, which equals about 22% over 25 months. So we are not holding our breath. On the other hand, the TSE is very heavily weighted towards the resource sector, so if the world economy gets going and commodity prices improve significantly, then a TSE of 10,000 in the year 2000 might not be that unreasonable. We will just have to wait and see. Regardless, our advice holds. There are still plenty of well-priced high quality Companies out there. If you own a properly balanced portfolio with the equity portion made up of a diversified group of high quality reasonably (or even acceptably) priced companies, in the long run you should ride out the bumps and do fine. You are unlikely to have a top performing portfolio, but you will probably do better than most, and in the long run, that is all you can reasonably ask for. The harder they fall, the harder they bounce back. Right? Well, at the end of October and early November it certainly seems that this is the case. We have been saying all along that the market would come back and that it might happen sooner than you think, however, we certainly did not expect it to happen this soon nor this fast. Actually, we are a little disappointed that this buying opportunity vanished so quickly. Still, we cannot help wondering if the other shoe is going to drop. Bear markets and corrections often take two significant dips (sometimes three or four or ...) before they end, and tax loss time is just arriving. Often in November and December, investors who have realized taxable gains sell some of their dogs so that they can use the losses to offset the gains. This can have a negative effect on the market and push prices down. So if the market shows some renewed weakness in the next while, we could easily see another major dip. Probably not as low as what we have recently seen, but it could still be enough to rattle some cages. If there is renewed uncertainty along with the dip coupled with a disaster or two, then the dip could bring new lows, even lower than the last ones. It is also possible that the bull will rage on and that we have seen the end of this correction. However, the vigor of this recovery makes us a little uneasy. Our recommendations have not changed. Stick to our four IFC principles holding a balanced and diversified portfolio of high quality securities. If you have some lower quality investments, this may be a good opportunity to unload them. If you have more money to invest, continue to add to your holdings on a regular and continous basis and as the opportunities show themselves. If you are fully invested and holding quality, sit back and enjoy the ride. We are sure it will be a bumpy one. Last month we said, "August 1998, WOW, we never expected it to end this way". We could almost say the same for September and early October, except that in the final analysis, the DOW was up for the month of September by about 4 percent. Really, but it sure did not seem like it. It still has a long way to go before it starts to feel good again, and it is going to be a very bumpy road. Historically, October is often a bad month for the market. Then in November, it is time for tax loss selling, something we rarely recommend, especially during times like this. However, it is bound to have some impact. So where is the market going to go next? We are still confident that the market will recover and that we will eventually be seeing new highs. It is just a matter of time, maybe a few months or possibly a few years. We believe that at year end the market will be above where it is now and that in 1999 we will be seeing new highs again. It would not even surprise us if our past prediction that the DOW will break 10,000 in 1999 comes true. Then again, if it takes longer than we thought, it would not be the first time for that either. It is our strong recommendation that you hold the line. Continue to hold a diverse portfolio of high quality stocks and continue to add to your portfolio on a regular basis. This approach is difficult to stick to at times like this, but at times like this it is more important than ever. Based on the recent markets, it appears that many investors are not sticking to this approach (hopefully none are our readers). Those investors have been divesting themselves of their stocks; selling during the weak market. They will continue to stay out because the market feels bad. BUT, may we remind you that the DOW went up from 7539 to 7843, (about 4 percent) in September, not a bad return for one month in anyone’s book. What if October, November and December all do the same? Bounce all around leaving you with that sinking feeling, yet slowly inching themselves back. At the end of the year, the market might have snuck back to 9,000, up about 20 percent in four months. By the time the market timers and the bears realize that the correction is over, they will have missed the boat again. Selling low during a correction and buying back during the highs. Now it may not happen that fast, however, it easily could and we know that eventually the market will bounce back. So as we said, hold the line, as difficult as it may seem, in the long run you will be glad you did. August 1998, WOW, we never expected it to end this way. Since April the market has been correcting. Now, the U.S. market is experiencing a technical correction, and if it drops one more percent from the August close, a technical bear market. In Canada we went from a technical correction to a technical bear market. We continue to use the word technical as a drop of 10 percent or more is considered to be a correction and 20 percent or more a bear market. In our view, technicalities aside, since April, we have been experiencing one of the many (albeit greater) corrections of the great bull of the 90’s. Where will things go from here? We expect sideways for a while, and the next 500 to 1000 points (in both Canada and the U.S.) could be in either direction, but we are confident that the next 5000 point move will be up. We expect the year will finish up from here, maybe only a little, but then again it could be closer to April’s high. Which leads us to the usual question, what to do now? If you are invested in reasonably priced high quality companies, then you are well positioned to ride out the storm and profit from the next major market rise, which could start any time, or be delayed for a few years, while the different crises and panics sort themselves out. In either case, if the companies you hold are sound, in the long term you have little to worry about, as the underlying value is there. If you are holding hot or trendy junk then you have a lot to worry about. So the approach is what we have been recommending in this letter since we first published it in 1994. Balance your investments according to your personal circumstances (regardless of the market). Stay diversified so that if you misjudge the quality of a company it will not impact you significantly. Invest in quality, then you will be able to ride out any storm knowing that in the end your companies will prosper. Finally, invest regularly and gradually. This last point deserves further comment. It is human to want to stop investing or sell your investments during times like this when the market is low. However, you should think of it as a sale and continue to invest. Remember the old adage, “Buy low and sell high.” Following your emotions could cause you to do the opposite. Last month we described the market as choppy. This probably best describes what happened in June as well and what we expect to see for another couple of months. The question is where will we be in the end. We expect that by the end of the year the markets will be up a bit, but probably not a lot. Then next year we expect to see the bull market persevere and we continue to believe that the Dow will break 10,000 in 1999. Be prepared though, as there is bound to be a lot of turbulence along the way, and truth be known, in the short run (a year or two) anything can happen. June was an interesting month. We had a fairly significant downward adjustment, then when we were just accepting that we would end the month with some losses, the market rebounded in the last few days. This seems to have been a common theme lately. In the end the Dow finished the month up just over one half a percent and the TSE was down about 2.5 percent. This leads us to another point. Do not pay too much attention to the market. What is important is your personal investments, not the market. We noted that while the TSE dropped 2.5% in June, our personal Canadian Stocks rose just over 4%. So was June a bad month or a good one for Canadian stocks. Apparently it was not that good for Canadian Stocks, but it was good for us. Of course, July and August could do the opposite, and it would not be the first time for that either. So watch the market, but pay more attention to your own investments as in the end they are what really count. The current market can probably be best described as choppy. In April, the Dow rose about 3 percent (TSE rose 1.4%), then in May it dropped almost 2 percent (TSE dropped 1%) giving up most of the prior months' gains. This is probably what we should expect for the next few months. The market will probably run up then decline, then run up then decline again until sometime in the fall. If it does there may be lots of buying opportunities over the next few months, especially for selective stock pickers. Then again, this is all a short run view and second guessing the short run is a fool's game at best. So let us look at the big picture. As you can see from the above table, the short term shows that Year to date (3 Months Jan. 1 to Mar. 31) the market is up just over 10%, about the historic annual return for one year. If we look at the longer periods, 10 year, 15 year and 20 year we see that the average annual returns of the U. S. markets are significantly over their historic average return of about 10 % per year while the Canadian market is very close to the historic returns. This would suggest that the U.S. markets have been over performing in recent years and that the Canadian markets are about right on a historic basis. Of course there are other factors to consider. If you look at the demographics, you will note that the Baby Boomers (probably the most powerful economic force of all time) are leaving the borrowing stage of their life cycle and entering the savings stage. Add to that the fact that the U.S. and Canadian Government’s are starting to get their borrowing under control and you have a case for low interest rates and low inflation. Add the emerging markets (Asia’s temporary crises aside) and over the long term you have the potential for unprecedented demand for North American products and expertise. Plus a growing word wide work force that when coupled with technology is bound to keep inflation in check. Over the long run, all this is a receipt for a great bull market and a thriving economy. Then again, even the best bull markets have corrections. We have heard it said that even in a bull market there are an average of three corrections a year of up to 5%. We cannot support or refute this number, but we can say that there will be regular corrections of this sort and occasional ones of 10 to 20 percent. We could even be experiencing one now, although we think that until the fall we will just be running through some choppy water, then we expect to see some more gains. As for strategy. Nothing changes! Stay invested, hold quality and as opportunities arise continue to invest. We do not know about the short run, but in the long run (ten or more years) we are very confident that this approach will pay off. What a month April was. First the markets seemed to be unstoppable. Then prices dropped near the end, wiping out most of the month's gains, then at the last minute they started to charge ahead again. This may be a prelude to what is to come for the next several months. Markets charging ahead, then reversing with a vengeance, then as investors start to bail out they will take off again. You may be saying that is what markets always do, and you are right. However, do not be surprised if for the next while the moves are with more vigor than normal. This added vigor is likely a result of a number of things; how far we are into the bull, emotions attached with new highs, how long this bull market has lasted already and since the Dow is at record highs, an equal adjustment is a lot more points. At five thousand a five percent adjustment is 250 points, however at ten thousand it is 500 points. We suspect that we will see two or three adjustments of about five percent before 1999. If we are right that means two or three 500 point drops. If we see a ten percent adjustment, not something we are predicting for 1998, but it could easily happen, the market will drop one thousand points. None of these things are really a big deal, but consider the emotions attached to a 500 to 1000 point drop in the DOW. Or a (20%) 2000 point drop for that matter. If you follow your emotions you are likely to buy high, sell low, buy high and sell low again. Then you might just swear of buying stocks. All of these choices are bad for your financial health. Where are we going? Up in the long run. We are sure that the DOW will break ten thousand, then twenty, and even one hundred thousand eventually. It is just a mater of time. Over all we expect that both the TSE and the DOW will see more record highs this year and likely finish the year above where they are now. We doubt that the DOW will break ten thousand this year. Then again, we have been wrong before. As for strategy. We are holding on to all our favorite stocks and adding new ones as we see buying opportunities and have more money to invest. On Friday, April 3, the DOW broke 9000, then closed just below 9000. It only has to go another thousand, approximately 11 percent, to break 10,000. So the question of the day is will it break 10,000 next year as we previously predicted, or will it do it this year. On the other hand, it could correct and not break 10,000 for two or more years. All of these are very possible scenarios. We were told, after publishing our February issue, that we were being too bullish. This accusation did not surprise us, but we really believed that a 10,000 DOW in 1999 was realistic. Now it almost looks as if we were being pessimistic. Well we still expect the DOW will break 10,000 in 1999, but if it happened in 1998 or did not happen until the year 2000 or later, we would not be completely surprised. The only thing that we are sure of is that it is just a matter of time until it happens. For that matter, it is just a matter of time until it breaks 20,000, albeit, somewhat more time, but that may happen sooner than you think. Why would we sell? We are investors who like accumulating wealth by holding a diverse portfolio of high quality stocks. That means buying more, not selling. We hate to sell, but we love to buy more. Yes sometimes we do sell, but not that often. If we change our mind about a stock then we immediately sell. We do not wait around for it to recover, after all if we no longer believe in that company, we have no reason to keep it. So we sell, then buy something we like. This does not happen often because we put a lot of emphasis on quality. If we feel that we are becoming overweighted in a stock or sector that is doing well, then we may reduce our holdings. Also, if we are concerned about our short term cash requirements (in this context short term may be 5 to 10 years) we may divest some stocks that we think are overpriced in order to create cash. Also, if we believe that something we hold is way overpriced, then we may sell some or all our holdings in it. Regardless of the reason, we rarely sell and are always reluctant to. Why is this the best long run strategy? First, lets remember Dave’s Rule from February, “The market is irrelevant.” What matters is the value of the companies we own. Since we hold quality, if the market drops, we know that we hold value and that sooner or later the market will figure that out. Also, because it is a diverse portfolio of quality companies, we may temporarily lose some ground during a correction, but overall, we rarely lose much. Sometimes we actually go up during a correction, as there is often a flight to quality, and guess what, when that happens, we have what everyone suddenly wants. Of course when the market goes up, we usually make money too. So the market goes down, we do okay, the market goes up and we do great. You might say that for bullish investors like us, the glass is half full and starting to fill up. Our biggest fear is not having more to invest. This issue is missing in action. We are trying to locate an electronic version. However, you can download a pdf file of IFC Market Outlooks from Dec. 30, 1996 to March 7, 1998 here. In January we wrote, "On Friday January 26, the TSE 300 index closed at the new high of 4901". We also wrote that an increase for the year of twenty percent to about 5600, would not be surprising. At the time this seemed optimistic, and many people told us that we were being too bullish. But our analysis said this was a reasonable expectation, so we made the statement. Now, it almost looks as if we were being bearish, as on Thursday, November 28, the TSE 300 index closed over 6000, up 25 percent from the beginning of the year. Years like this are very common, but then, years where the market loses twenty percent are not uncommon either. That is how stock markets move. Not in regular even amounts, but in spurts up and down. Usually by the time you realize that a major spurt is happening, it is over, and often has changed direction. Luckily, the one consistent is that over the long-term, equity markets do go up, and this is one trend that we expect to continue. When you look at the big picture, the world economy is growing, third world countries are starting to develop, and Canadian resources and expertise are starting to be demanded. In Canada, the baby boom is starting to enter their savings years, the government is starting to get a handle on borrowing and inflation, and interest rates are perceived as being low. All of this means that Canadian companies should grow and prosper, and there should be demand for equity investments. If this is the case, then this bull market may continue for a long time. That being said, it is obvious that you should keep a healthy portfolio of equities. Nonetheless, you can be sure that it will not be a smooth ride. You should expect to see some good years, but expect the market to correct by as much as twenty percent on a regular basis. Also, be prepared for more severe corrections, in the range of forty percent, because that could easily happen, even in the middle of a bull market. What does this mean in terms of strategy? Well, it leaves us more convinced then ever that the best advice we can give you is to follow our IFC Investment Principles, but now that the Bull is full of steam, we cannot overemphasize quality. There are two reasons for this extra emphases. First, during strong markets, people start to be caught in a rush to invest, then without warning the market corrects, usually after those on the sidelines and the biggest bears have jumped in. It is almost as if the market decided to teach them a lesson. During these corrections, most stocks lose some value, but generally, the better the quality the less they drop. The lower quality high flyers are often severely hit. It does not necessarily happen this way, but in a typical twenty percent correction, you might expect to see poor quality portfolios lose over forty percent, while the high quality one's lose less than ten percent. Remember, if you lose ten percent, you have to grow about eleven percent to make it back. If you lose forty, you have to grow about sixty-seven percent to make it back, and if you lose fifty, you have to grow one hundred percent. The second reason has to do with the nature of quality shares. When markets take off, the highest quality shares often lag behind it. Then as the bull matures, the high quality shares start to pick up and often pass it. So from a timing point of view, their turn may be coming. Interesting enough, we have noticed that many of our favorite companies have been lagging the market until recently, but now they seem to be starting to pick up steam. Maybe that tells us something. Remember this if you have some favorite mutual funds that recently have not been performing as well as you might have hoped. What a month October has been. On Friday, October 26, 1996, the TSE 300 index closed at 5550. Up almost 5% from September 30, and almost 18% from the years opening of 4714. It is also interesting that the Dow Jones Industrial was up just over 17% and the Standards & Poors 500 was up almost 14% from the beginning of the year. So the Canadian market, which normally lags the U.S. market, seems to be starting to catch up. We believe that this trend will continue, as the international economy picks up steam, there will be demand for Canadian resources and expertise. Also the Canadian Federal Government seems to be making headway in reducing the deficit, and finally it appears to be committed to getting its fiscal house in order. If these trends continue, they should cause the Canadian economy to grow, which will increase profits and ultimately share prices. So we continue to be bullish on Canadian Equities. However, we also continue to stress all our IFC Investment Principles. And the bull rages on. On September 27,1996 the TSE 300 index closed at 5305. Up a couple of percent in one month and almost 13 percent from the year's opening of 4714. Not bad considering that a regular bank savings account is yielding less than one percent and Treasury bills are only yielding about four percent. Of course this is now history, so we must question what comes next. We do not believe that the bull is near its end, however, the TSE's Price Earnings ratio is about 20, which is getting on the high side. So, for further sustainable growth, corporate earnings need to grow. It is also fair to say that the stock market as a whole is no longer undervalued, it may even be a little overvalued. So what does this mean to your investment strategy? We think it means that our IFC principles number 1 (Balance your investments according to your personal circumstances) and number 3 (Invest in quality) are more important than ever. We expect that the economy will continue to grow taking corporate earnings and share prices with it. So it is important to have the right balance of quality equity investments. However, if you have too much in equities, you may find it hard to weather a major correction and if you are not holding quality, you are at risk of seeing your investment values drop significantly. If you are doing any new investing, or replacing current investments, look for shares of well-valued quality companies, or conservatively managed mutual funds that concentrate on value. Over the next while we think this is where you will get the best returns. following is a list of 1996 closings for the TSE 300 index. As you can see, before accounting for dividends, the TSE is up about 10 percent from its 1996 opening value. You can also see that it moved in a couple of spurts, then corrected, then moved back up again. All this is pretty much normal activity. You may recall that in our January 1996 issue, we suggested that it would not be surprising if the TSE went up 20 percent to the 5600 range. Well, the year is a little more than half over, and the market is half way there. Of course there is no guarantee that it will reach these highs this year, but we can say with almost 100 percent certainty that it will eventually exceed this amount. So our position holds, we are still bullish on Canadian equities, but as always, our advise is to continue to balance your portfolio according to your personal circumstances, as in the short run, anything can happen. Well this month it finally happened, the market correction. From June 1 to June 21 the TSE 300 index dropped almost 200 points, about 4 percent. We knew it was coming, we even said it was coming, we just did not know when. If you listened to the bears at the end of last month, you should be very happy, if you listened to us and stayed in the market, you may be asking yourself why. The reason why is the same as the reason for staying in the market now. We know that the market will go up again, we also know that more corrections are on the way, if we knew when, we would make a fortune. Unfortunately, we do not know when, all we really know is that historically equity investments go up over the long term. We also know that this long term trend is necessary for economic growth, and without economic growth, there are no safe investments. You may be thinking that you could have guessed this one was coming, and you are right, but when would you have made the guess? At December 31, 1995, when the market was at 4714; January 31, 1996, when it was 4968; February 29, when it was 4934; March 31 when it was 4971; April 30, when it was 5146; May 31 when it was 5246; or now when it is 5048. As you can see, even though the bears have been predicting a correction all year, there was really only one good time to get out, and that was around the end of May. However, we also point out that the market is still up about 7 percent from year end. So now what? Well the correction may continue, but chances are it is over. Our position holds, we continue to be bullish on Canadian equities. Nonetheless, regardless of any projections, our recommendation will continue to be to ignore the markets and balance your investments according to your personal circumstances. On Friday, May 24th, the TSE 300 index closed at 5229. Up about 1% from April's close, about 5% from March's close and about 11% from 1995's close. If you have remained in the market, you are probably glad you did. If you listened to the bears and have been avoiding the Canadian markets since year end, you just missed an opportunity to get an 11% return in five months. So, what about the rest of the year. We remain bullish on Canadian equities, and hold to our statement that a twenty percent increase for the year is not unreasonable. This could happen quickly, or we could see an adjustment first. The rest of this growth could even be delayed for a year or two, it all depends on investor psychology. However, fundamentally we do not think that the Canadian markets are over valued, and we expect that profits will continue to rise for the next year or two. So you can listen to the bears if you want, but remember that you may be taking a bigger risk by not investing than by holding a suitable balance of equities. For the time being, the market seems to have stalled. The TSE 300 index ended 1995 at 4714. Then it started a nice rally, closing January at 4968, and since then has pretty much stayed in the 49 hundreds. This leads to the usual questions, has it stalled, is the rally over, is a correction coming? Added to that is the concern that in January and February the market may have been flooded with new RRSP money being invested in equity mutual funds. Some people are speculating that now that the rush is over, the level of new investment will decline and take the market with it. We do not agree. In the short term, anything can happen, however, we do not consider the Canadian market to be over valued, actually it is about right for current profit levels. Also, profits are on the rise, and they should ultimately take share prices with them. Of course that still leaves the question of new RRSP money. However, if there was a lot of new money put into these funds, and we believe there probably was, then this should fuel the markets over the next several months. This is because when people invest in mutual funds, it does not flow directly into the market. It increases the cash reserves of the funds, which gives the managers new money to invest. Then the managers use that money to add to their holdings (by purchasing more stocks) as appropriate opportunities arise, and that could take several months. In light of this, we are still bullish on Canadian Equities, but as always, we continue to recommend that you follow our IFC Investment Principles, and pay little attention to the markets. During February, we have seen some minor market corrections. This leads us to ask, will there be a breather, a correction or will the bull market continue. The answer is, yes, yes and yes. We have no doubt that all three will happen, we just do not know the order, or severity. However, we are still very bullish on Canadian equities, and luke-warm on U.S. equities. The main reason we like Canadian equities is that earnings have been rising, and we think that they will continue to rise, yet prices have not risen that much. Also, we have lagged behind the U.S., and historically, our markets tend to follow the U.S. markets. As always, even though we are bullish on Canadian equities, we continue to stress that no matter what your forecast, you should stick to our IFC investment principles. After all, all forecasters are wrong from time to time, but these principles, will help ensure you do not miss opportunities or get burnt by corrections. As we are writing this the stock market is hitting new highs with regularity. This will lead many to wonder if it can last, or is a major correction around the corner. This concern is understandable, but we think it is premature. We find it interesting, that whenever the market hits new highs, people start believing that a major correction is coming. Actually, the markets have been hitting new highs since the day they opened. We are not sure what the TSE 300 index started at, but presumably, it was once set at 100. On Friday, January 26, it closed at the new high of 4901. If you think about it, this means that technically there have been four thousand eight hundred and one new highs since the index was set at 100. After all, every single value between 100 and 4901, had to be reached a first time, and therefore was once a new high (albeit, maybe only for a split second). Also, there has been little public hype. It is when everyone starts becoming excited, and cannot wait to invest, that we get nervous. If we can add to the analysis in our last issue, comparing the eighties to the nineties, we think that an increase of twenty percent in 1996 would not be surprising. A twenty percent rise in 1996 would have the TSE closing around 5600. This may seem hard to imagine, but really, it is not an unrealistic expectation. Now, having said that, lets but things in perspective. First, even if 1996 turns into another bull year, there will be setbacks along the way. However, if you wait for an adjustment, you could easily see the market increase another five percent, before declining by three. On the other hand, if you start plowing all your money into the Canadian stock markets, you could easily see a major adjustment, right after you invest, or maybe the bull will be put on hold for a few years. That is not what we are predicting, but that too is possible. If you think this sounds a little coy, you are right. But, it is the future that we are talking about, and we do not know what it holds, just what is a reasonable expectation. So, as always, until we get our crystal ball working, we suggest that you remain optimistic, and continue to follow our IFC principles. As we come into the new year, it seems appropriate to review the last and discuss the next. Unless something drastic happens during the last week of the year, in 1995, inflation in Canada will have been just over two percent, the Canadian stock market total returns about fourteen percent and the U.S. stock market returns will be about thirty-five percent. For Canadian equity investors, the year was like a see-saw, we were up, then down, then up, etc., but in the end, not a bad year for Canadian stocks (beating inflation by over six times) and a remarkable year for U.S. stocks. If you will permit us to blow our own horn, we believe that our advice continued to be bang on all year. We continued to stress proper balance so you could live through the down periods and be positioned for the ups. In our December 1994 issue, after a disappointing year, Dave's Rule was "Good things come to those who wait," and we believe they did. In that same issue we stressed the importance of averaging, and warned about going overboard in emerging market funds. Well, in a year like last, averaging would have paid off in spades. We also note that as at November 30, 1995, the ten mutual funds with the worst one year performances were all emerging market funds. In May, we discussed the benefits of getting international exposure through multinational North American companies. As the U.S. market return was about thirty-five percent in 1995, this was probably the best way to get foreign exposure. In September, we warned about the dangers of market timing. It seems that at the end of 1993, people were eager to buy equities, as the TSE returned over thirty percent that year. Then they were bailing out in 1994, after a flat year. So they missed the thirty percent year, were in when the TSE returned approximately zero percent, and missed a fourteen percent year. Those who think they can ride a wave must be getting pretty frustrated about now. Okay, enough about last year, what about next. We had a look into our crystal ball (we actually do have one), but the vision is somewhat hazy. So we will have to do this the old fashioned way and analyze the past and present. Our initial feelings are very positive for Canadian Equities and somewhat neutral for the United States. In Canada, based on earnings, prices are probably about right. Also, there are several factors that could have a positive effect on Canadian Markets. We believe that inflation and interest will remain relatively steady. We also believe that profits in Canada will grow, fueled by a demand for Canadian expertise and resources. It also appears that the Federal and Provincial governments will continue to meet or exceed their deficit targets. All of these factors are positive, and we see no reason why Canadian markets should not do very nicely over the next year or two. Not to mention, that in relation to the U.S., we seem to have some catching up to do. A little review of history also makes us feel comfortable. The similarities between the Canadian markets of the eighties and the nineties, so far, are remarkable. In the first two years (1980, 81 and 1990, 91) there was an up year of over ten percent and a down year of over ten percent. The next years (1982, 1992) were fairly flat, the next (1983, 1993) returned over thirty percent, then a minor loss (1984, 1994), and then sound gains in 1985 (25%), and 1995 (14%). In 1986, the market gained nine percent, in 1987 it gained six percent (even after black Monday), in 1988 it gained eleven percent and in 1989 it gained twenty percent. Looking over the last forty-six years (1950 to 1995 inclusive), we see that U.S. stocks have shown returns of about twelve percent per year, Canadian stocks about eleven percent per year and inflation has averaged about four percent per year. If we compare this to the last ten years, ended November 30, 1995, we see that U.S. stocks have returned about twelve percent, Canadian stocks about eight percent, and inflation has been about three percent. Considering straight returns, the U.S. has matched its historic return, and Canada is below its historic return. However, as a ratio to inflation, we find that the U.S. return is slightly above its historic return and Canada is about equal. The above makes us bullish on Canadian Stocks and somewhat neutral on U.S. stocks. However, we should remind you that history has shown that in the short run, markets are often unpredictable. So, until we get our crystal ball working, regardless of any predictions, you should always be properly balanced and prepared for surprises. This leads us to the question, what should you do in 1996? Our advice is to continue to follow our IFC Investment Principles, but also make sure that you are not underexposed in Canadian stocks, or over exposed in U.S. or international holdings. Other than that, be patient, do not worry and enjoy the ride.